JUMP TO THE LAST PAGE FOR THE LATEST NEWS AND DISCUSSIONS! PLEASE NOTE A LOT OF THIS INFORMATION IS OUTDATED! I'VE LEFT HERE TO SHOW WHERE WE STARTED FROM. CHECK OUT OUR WEBSITE FOR THE LATEST INFORMATION. Hey guys, so I know you guys LOVE technical details, so I thought I’d put together a sort of brief of some stuff I’ve been working on. I hinted at this in my introduction thread (HERE). Feel free to ask me any questions! This is the first foray into the bike lighting market, taking the latest in automotive LED technology, sources, materials, and design methods to produce one of the best all-around bike lights, period. This is not a claim that is being made as marketing fluff. I personally designed these lights using my many years of experience as an automotive optical/illumination design engineer. 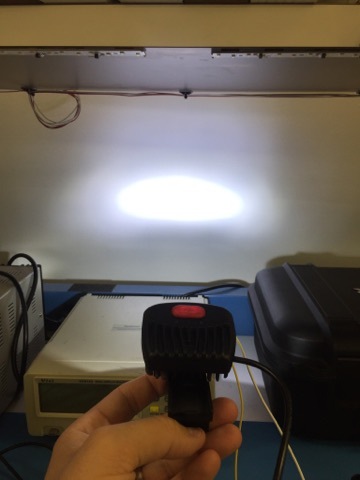 I design automotive lighting for a living and was frustrated with the lack of a good trail light that could be REALLY good, knowing how automotive lights are designed. Big lumens put into tiny lenses, nothing but spot and flood optics, poor thermal transfer, the list goes on and on of the typical bike light. There are several VERY good options available in Europe from companies such as B&M and Supernova, but those are focused on the road and for E-Bikes. Therefore I set out to develop my own bike light using what I know, and it has morphed into Outbound Lighting. This is the first product from Outbound. Using OSRAM Black Flat automotive grade chips, a downward firing multi-segmented reflector, automotive grade optically clear silicone lens and a magnesium die cast body to wrap everything into a highly efficient, well-engineered, robust bike light that I hope will redefine what you come to expect from a bike light for the trail. Design of this bike light came after using several higher end lights, as well as dozens of cheaper lights from Amazon and other retailers. 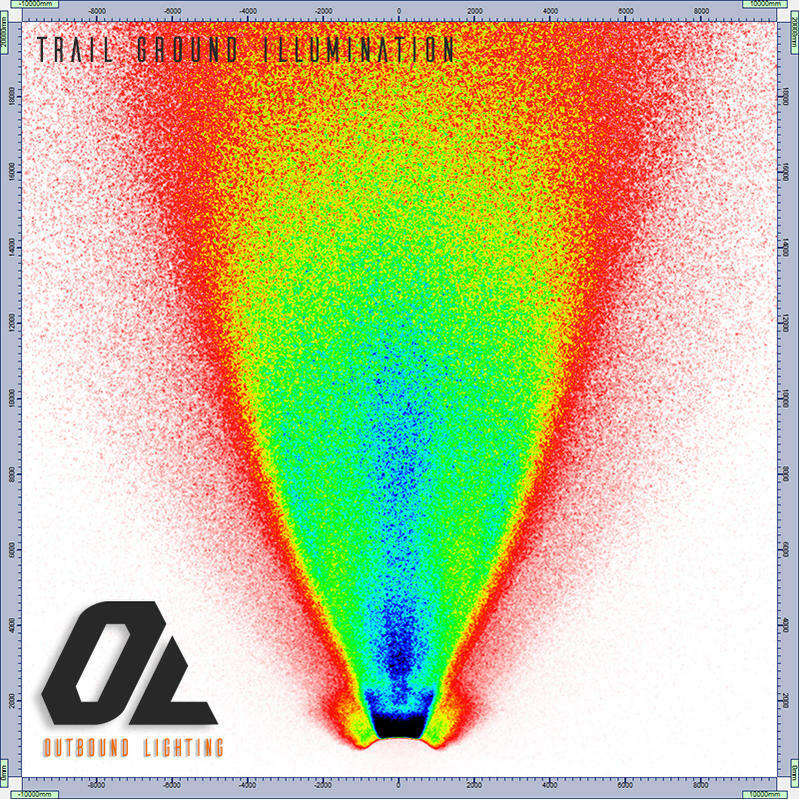 The common theme for almost every trail oriented light was a spot beam pattern, and a few that had an elliptical or a rectangular beam pattern. This is a great compromise in theory, and it gets the job done. However in knowing how automotive lights are designed to give the wide field of view, as well as even illumination on the ground, along with an intense main beam, I knew there was a lot of untapped potential for the trail. The design of the optics came from hundreds of hours in OPTIS simulating almost every combination I could think of, as well as many different LED sources. In the end settled on a multi-segmented reflector that creates an even, wide and smooth intense beam pattern across the field of view of the rider, as well as creating a “light carpet” on the trail that allows for even illumination from the bike tire all the way out to your main focal point on the trail. 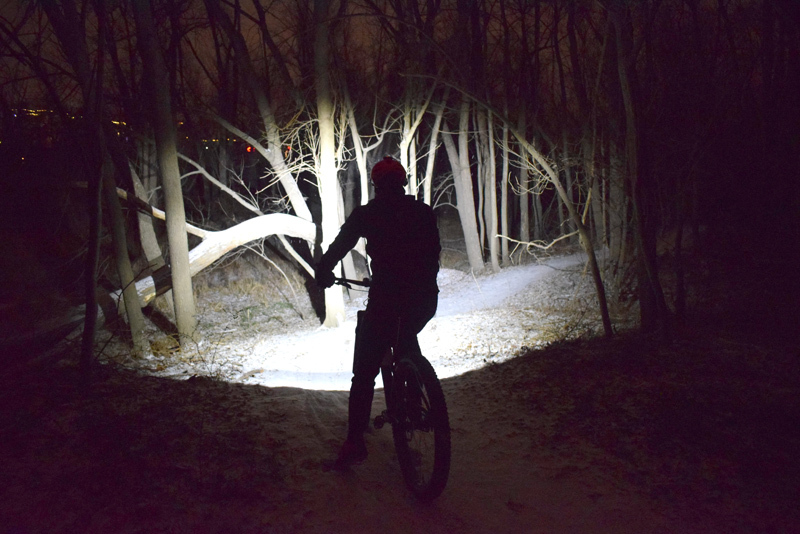 This lets you attack both the high speed and the tight and twisty sections of a trail without having to readjust your eyes, or mount up multiple lights. What you end up with is a rather unique looking beam pattern that may look somewhat odd when lit up close against a wall, but mount it onto your bike and dive into the trails deep at night, and it will redefine what you will expect from a light. The road series optical beam pattern is similar to the trail in terms of width and the “light carpet”, however it has a cutoff, as well as a more focused hotspot (almost triple the candela) that allows to see further down the road whether bombing a steep downhill at 50+mph, or just hoping to pick up that odd critter or pothole that has somehow wandered into your path! This is a shot of the trail ground illumination plot. Think of this as a birds eye view looking down, and seeing the light intensity directly on the pavement, or the trail. The green is representing 60 lux of illumination, which is more than enough that the human eye perceives it as “very bright” when in darkness. Notice how this green is extremely even from the center point of the bike, all the way out to 70’, and then falls off more from there. So as you can imagine, this is a light that is going to not only let you see further down the trail nicely, but also what’s on the trail in front of you without having to aim your light down, sacrificing the light you use to see straight on! As well as the very wide width that it entails. If interested, I can dive into a lot more technical detail of exactly how this beam pattern was designed, the optics, the math behind it, and more. These are details that most companies would call proprietary, or “competitive secrets”, but in reality it is most likely because they picked out some optics from a catalog, or hired an optical company to do the work for them and cannot explain it like we can. Since we are designing every part, every optic, and every electrical circuit here in St. Louis, MO, we are happy to share details and specifications as questions arise. One item that comes up often in this forum, that I do like seeing, is that thermal is discussed! As many of you know, thermal control is very important for not only LED life, but also the optical output, color temperature and overall reliability. This is also why I had opted for a downward firing reflector as opposed to a typical TIR or reflector bowl, since it would allow for more a more optimal thermal pathway from the LED chip to the incoming airflow. The main LED board (copper core board) is separate from the control board, and it is monitored using a thermistor that is located near the chip. We don’t expect that when the light is in use that it will reach a thermal step-down, but of course need to plan for the worst if we want to have a reliable product. Many thermal simulations were run to decide on the final design. Early prototype shots that are shown later on are using an older design that has since been optimized further after receiving the machined prototypes. The beam pattern has even been designed such that it forces the user to partially aim the light “down” just slightly, so that incoming air is hitting the back of the LED heat sink directly. Combine this design decision, with large die cut thermal interface material (not just globs of paste) that are sandwiched together by the magnesium die casting, and you end up with a very well designed, thermally optimized heat sink that is not only thermally efficient, but also very lightweight due to the magnesium material choice. When using the included large thick silicone strap for mounting on the handlebar, you will notice that the mount itself has an integrated air scoop that helps force more cooling air into areas of the heat sink that otherwise would be hard for air to reach in a conventional manner. Again this scoop was thermally optimized for overall height, fins, and more to help achieve the final design. This is the one portion of the design that I outsourced to an extremely experienced freelance electrical engineer in Kansas City who mostly designed high power driver circuits for RC cars and other battery operated devices. So developing an efficient driver was no issue for him! Initial prototype testing is showing 93-95% efficiency from the battery, through the wires, through the connectors, into the board, through the driver, and to the chip. We are using integrated software to control the LED, monitor the temperature, adjust brightness of the status lights, as well as an “adaptive” mode that will use some human physiology to help extend your battery life while maintaining that same perceived brightness. Another key point in the electrical design includes using an automotive grade LED. Right now working around an OSRAM Black Flat, however we may also opt for a LUXEON Altilon SMD. Both are the same chips that you find in every single OEM LED headlight on the road. You will never find a CREE LED being used as an optical source for headlighting except for aftermarket products. There is a reason for that. Not only thermal stability, but also the extremely small emitter size allows for extremely high luminance, which helps with the optical design, and helps keep optics smaller. More on this topic goes hand in hand with optical design, so I’ll save the nitty gritty details for later! Designing for reliability was a set goal from the start. I had several lights fail on me when I was benchmarking many cheap lights. Some were due to thermal overload, and some were due to fatigue on the wire connections since they were poorly soldered down. This is why we opted to not have ANY soldered wire joints in the design. Power comes in and is put into an automotive grade wire-to-board connector, then transferred to the control board through another thick board connector. All components are solid state and chosen for reliability, not cost. Of course when designing a light for the trails, robust and lightweight design is absolutely needed. Thin wall magnesium die casting allows for a very lightweight head given the size, as well as still being strong enough to withstand a hit or a drop from the bike as the main corners of impact were thickened as needed. Optical grade silicone is used for the lens. This is a rather new material that is making its way into some automotive headlights (namely Mercedes Benz Matrix LED lights), it is clearer than PC or PMMA, while offering superior scratch resistance, as well as being able to mold in a gasket that helps make the entire light waterproof. Part consolidation helps reduce points of failure. The incoming power wire is thick, and includes an overmolded grommet that provides both strain relief, as well as waterproofing the light. Mounting of the light comes from a very thick silicone strap that uses two types of silicone. The main strap itself is a tough and rugged silicone as well as stretchy enough to pull tight on the bar. The bar “pad” that sits on the mount itself is a softer silicone that acts as a grip on the bar. The small ridges and soft material means that the strap holds onto the bar tightly, without marring those expensive carbon bars! I’ve already had several hard crashes on my own personal bike that resulted in losing several cheaper lights I bought, but my own strap design stayed absolutely solid! GoPro mount adapter will be included on every light head. More future mounting options will be available as more people give me some ideas on how they want to have their lamps mounted! So ideas are always welcome! 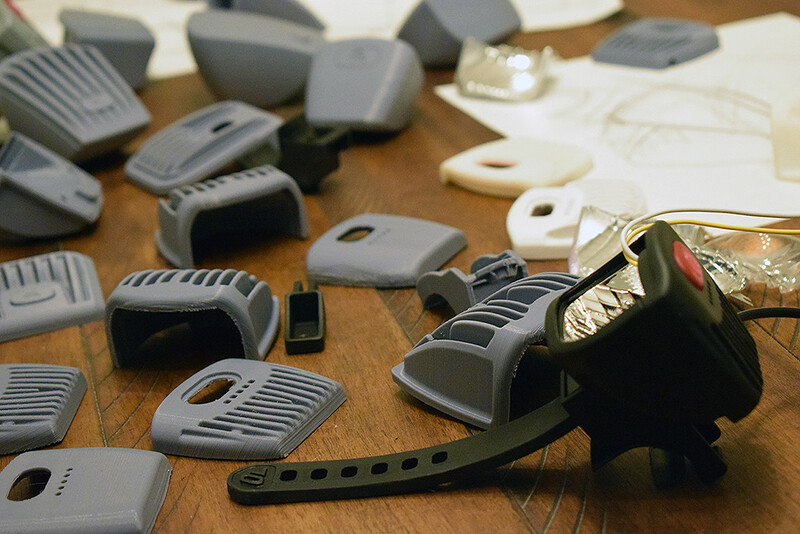 Currently we have paid for the tooling to get these parts started after getting prototypes that worked out well. We will have a rough self-contained alpha prototype that I’ll be able to take onto the trails hopefully by the end of this week. Currently the prototype shots shown are showing an earlier build, as well as slightly different beam pattern design. It is very hard (and very expensive) to prototype reflectors, so the beam pattern is not perfect. We are shooting for a release date on November 5th (daylights savings day!) and will be working with local bike groups and events to get some more people interested in night riding. As many of you know, it’s just an absolute thrill to hit a trail hard at night. Feels like a completely different world! I honestly hope these lights will help bring more people into the night riding community, and help extend their riding seasons even longer. I am extremely passionate about lighting, and about biking, and so this isn’t just imported product that’s being rebranded as my own, this is a light that is being developed from the ground up to hit the goals I feel that have been missing from bike lighting. I strongly welcome any questions, opinions, and more! I want this to be the best light, period! Last edited by Outbound; 10-03-2018 at 06:10 PM. Well, your offering looks very interesting. I didn't have a chance to read it all, but will come back later. I think your best way of promoting your light would be to get in touch with Francois of the mtbr management team and send him a light for evaluation. Every year starting in the fall he puts together a massive night light review that's better than anything the magazines do. He will do an unbiased review of your light and give it a fair judgement. Last year he gave his award for best light to a company that no one here had ever heard of. Wow! This sounds fantastic, but I'm scared to hear the price. Would love to see some trail beamshots! Right now our plan is potentially around the $225 price point with the battery pack included, and $135 with the light head separately. Though we haven't nailed down the pricing on the OSRAM or the Lumileds chips, so that might fluctuate a little bit. This is NOT going to be a $400-500+ light, that would be just be asinine, and I feel turn a lot of people away from the joy of night riding. I designed this light to be easy to assemble (will be assembled in the USA) and with as few of components as possible to keep the price low. Will there potentially be some high dollar "halo" light that is just a ton of lumens to get attention at bike shows or events? Probably. Because those are just fun engineering exercises, that do in fact cost a lot of money to make. As for beam shots. This is the only one I have right now that I took several weeks ago. 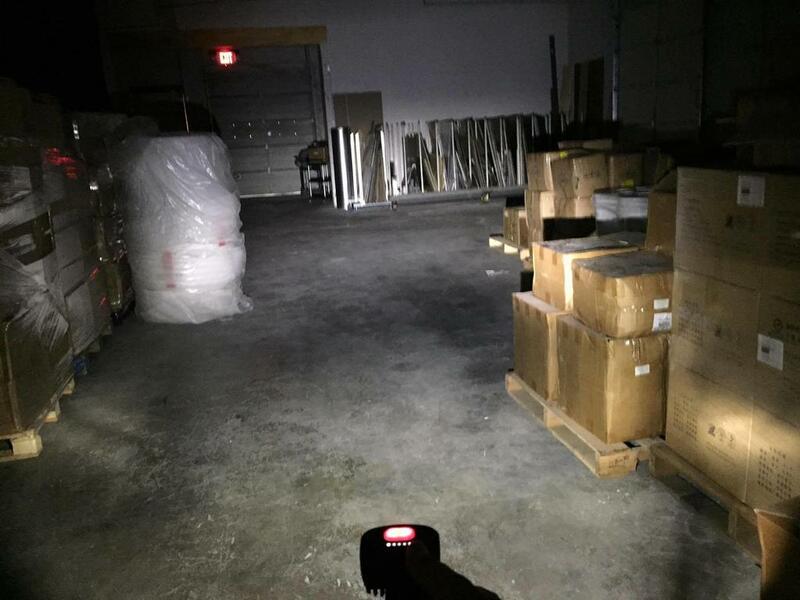 This is at around 400-500 lumens, in a pitch black warehouse as I had to power the LED directly from a power supply. So not exactly representative of a trail per say, but can get an idea of the even illumination and wide FOV it will provide. This doesn't have the silicone lens in place that will provide some more width in the corners as well. As I mentioned, hopefully will have a unit that I can take on my local trail to get some beam shots, and hopefully some video. I've picked up a nicer DSLR that I just need to figure out how to attach to my bike, or myself so that we can get a much more true sense of the light pattern rather than the typical overblown or underexposed GoPro video. *EDIT* I want to note that the button will NOT be backlit, there was no control board in place when I took that picture, so that button is just getting illuminated from some stray light. The status lights will be illuminated, but will be programmed to be very dim when in use, brightening when there is a status change, or the battery levels drop to alert the user. Otherwise it will be a very low-lit unit so that your eyes are not picking up a bright foreground object. I agree. I had reached out to the MTBR staff a month ago or so explaining what I am doing, and wondering what the deadline was to get into the shootout, but I have not heard anything back yet. I do slightly disagree with some of the testing merits (namely the lux testing) but it's great to have all the lights lined up at once. I'd LOVE to see MTBR adopt the same testing strategy that Action LED Lights uses (https://www.action-led-lights.com/pa...-beam-patterns) as I think that is a fantastic measure of beam performance and light. As many of you know, big lumens doesn't always mean big performance, and the MTBR test seems to lean more on the lumen number than a legitimate lux number, as well as very hard to get a true sense of the actual beam pattern in pictures. But they at least do go and ride to get an idea of what performs best in the real world and don't just pick the biggest lumen number, so that is why I am trying to find out what I need to do to get my lamp in there. Action LED does a great job objectively measuring the beam performance of many lights. Only improvement I'd love to see is to have all the measurements normalized in terms of lux output, so easier to jump between graphs and compare different lights. First, welcome to MTBR lighting and night riding forums. Your lamp design ideas looks quite interesting. I like the look ( as it does seem to be somewhat the same form factor as some German Euro-lights ) but the most important thing when it comes to this kind of lamp is the actual beam pattern it produces. Over the last year I've been really interested in lamps that provide a "upper cut-off beam pattern" primarily for road use. Of course as you already know designing a lamp that can produced the desired effect is not an easy thing to do ...BUT...more people are starting to get it right and I find that a most pleasant prospect. In keeping with the idea of creating a new and innovating product designed primarily to mimic a beam pattern from a car I personally have a number of priorities when considering using such products. First, I like the beam pattern transition from near to far to be as smooth as possible with as little dead space, spots or artifacts in the beam pattern as possible. ( less light up close but more at distance ). It also needs to be fairly wide so we can spot those deer that graze on the side of the road way before we get to them. Last but not least, brightness is an issue but so is beam tint. Real important not to use an LED array that might be too bluish. Bright white ( for road use ) works really well for road use, NW for MTB'ing. Lastly, the optical array needs to supply a defined cut-off. Personally I find if this cut-off is nice and sharp it helps the user aim the light properly. Then again nothing wrong with a smoother transition at the upper cut-off as long as the user can still figure a way to aim the lamp properly. I look forward to seeing the reviews on your lamp when you get it finished. You have some intriguing ideas. Just keep in mind you have some good competition but if you create a lamp that can cover the needs of mountain bikers and road users...that indeed will be some feat if you can pull it off. Just keep in mind the needs of MTB'ers are not the same as road users. What I tend to like on a road bike is not the same as what I like on a MTB. On a mountain bike you almost have to have two lamps because at times the bike goes in one direction while you need to look and see in another. 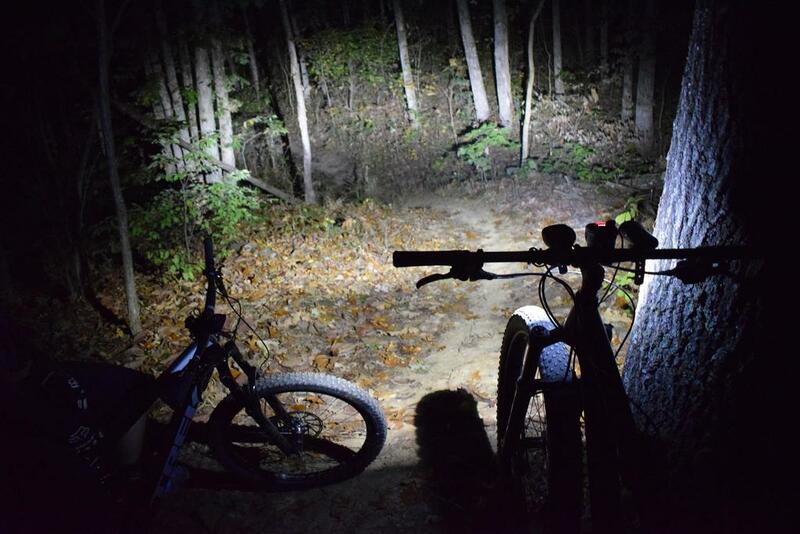 A single bar lamp is simply not going to be the best option when mountain biking. That is why almost all MTB'ers use a bar and helmet lamp. Road use is completely different but only because at most times the needs and environment of the cyclist on the road is different. 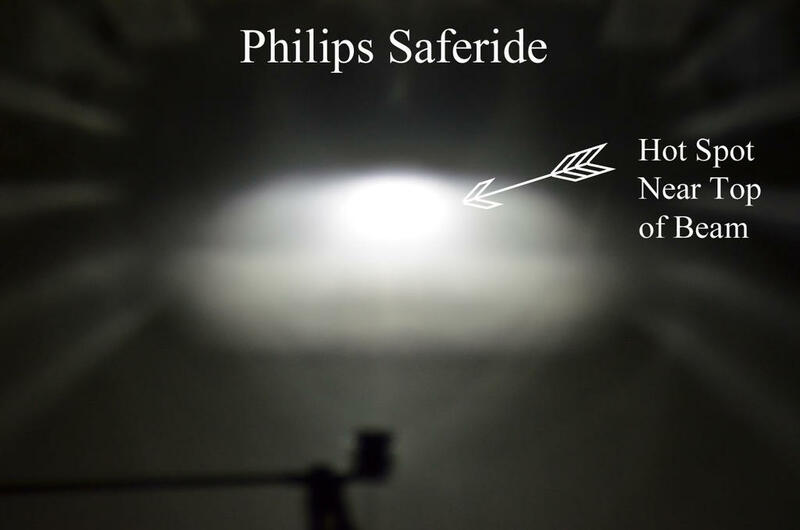 As you already know, a lamp using a single optic or mirror array can produce the desired beam pattern for road use. However, as nice as that beam pattern may be it may not be able to produce the needed "high beam" effect that cars get when they hit their high beams to see farther into the distance. Road cyclists need this feature too. So far I've not seen anyone pull this off just using a single optic array and the ones who are using two optics ( built into one lamp ) have not been real successful ( IMO ). At the moment I use both a lamp designed for road ( cut-off beam pattern ) and a separate MTB type lamp on my road bike to provide the occasional needed high beam function. I rarely need to use the high beams but when I do it comes in REAL handy. Now if your lamp can remove the need for an extra lamp that would indeed be something to see. One last parting comment; If your lamp can do what you say it can it would be really important if that lamp included some type of remote feature. Lamps that feature remote control are really popular and give the user many more mounting options as well as making sudden light-mode changes much more easier and safer to accomplish. Sounds like you have my optic defined just right. The width pushes -40 to +40 of intentional designed light. Typical higher end lights like the NiteRider have a maximum beam width of around -30 to +30. The smooth blend from near to far is absolutely spot on. It's easy to figure out the transition amount with a little math and some spreadsheet work. Do the work to find out the distance from the lamp mounting height to the ground plane, then back track the consistent lux you want to maintain (in this case, I chose 60 lux) and what you get is basically a logarithmic gain in candela (light intensity) that helps make that even transition from directly in front of you, where you don't need that much light to make 60 lux on the ground, to 20-30-40 meters out where you need a LOT more light intensity to illuminate the ground at a consistent 60 lux. 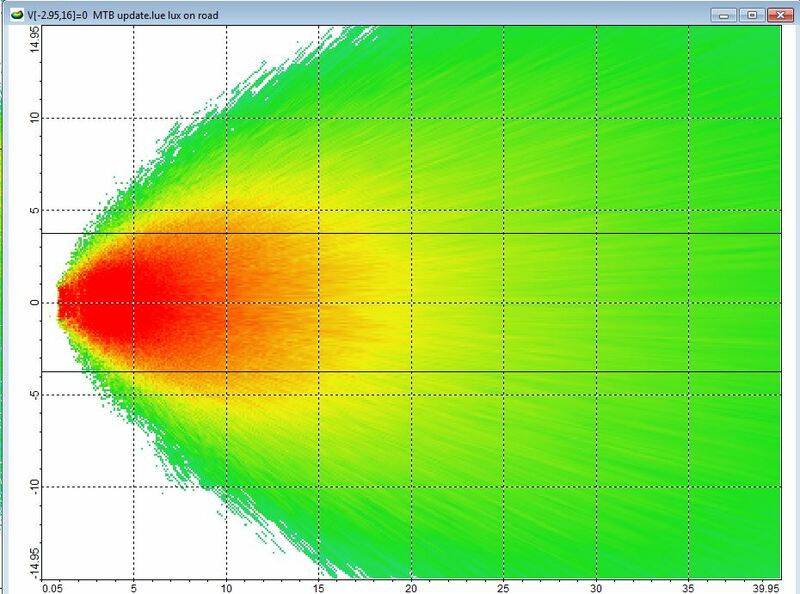 This is why the beam patterns I designed have a fairly rapid falloff when you are just looking at a color plot, or shining against a wall. However light that up on a pathway, a trail, or a roadway, and it all clicks. Agree on the color temperature. Most modern automotive LED's are using a more natural white color because of that reason, and because they have to conform to SAE standards for color temperature. You tend to find the blueish tints being used in cheaper lights, or lights with poor thermal capacity that causes a color shift. I do hope that I didn't lead people on thinking that the road and the MTB optic are in the same lamp. They are separate units that are using two different optical reflectors. 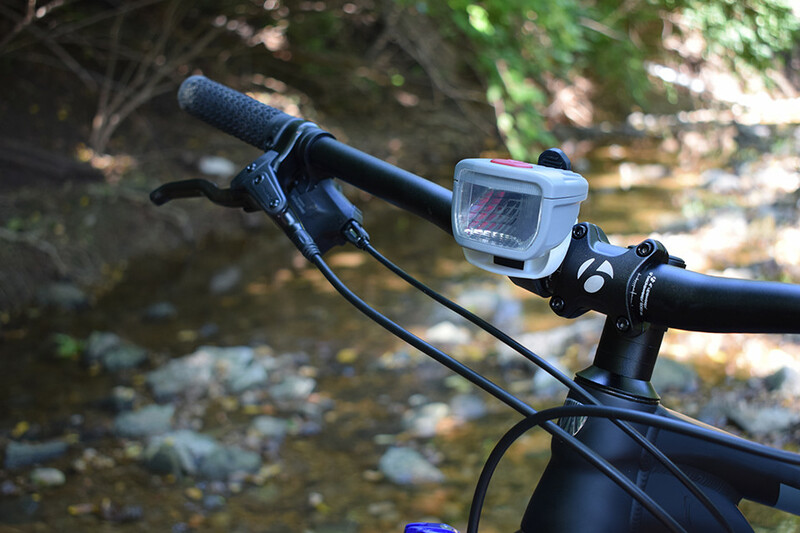 This is why I am intending on offering both units for purchase on their own at a much lower price without the battery pack in case users want to have a MTB specific light for their trail bike, and a road specific light for their dedicated road bike. I know that some users might use the same bike for both, but that might be a future product where we can make both work (and I know we can). 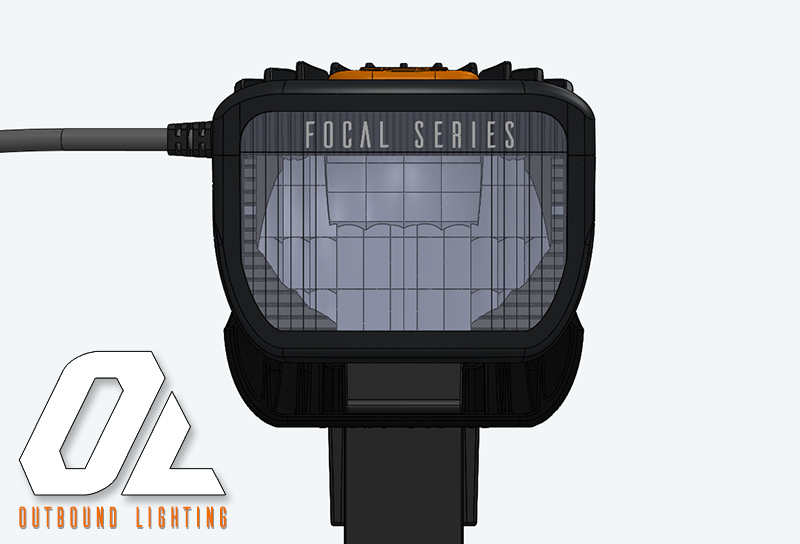 I fully look forward to hearing the opinions of this lighting community once we have a beta prototype and start delivering the first production units. Any improvements will be quickly implemented if the light is a success, part of the positive of having it all designed here, including the software, electrical, mechanical, and optical design work. As for the bar mount vs helmet mount. I personally do not like helmet mount lights when I am doing my own trail riding, but I come from a rally racing background where sliding the car sideways through a fast corner with the light pods on the hood is natural to me. So I've always prioritized a wide even beam pattern over a peaky spot or floody flood type lamp. I chose the beam angles from my own personal trail riding experience that ranges from fast flowing wide open fields to some real narrow tricky rock gardens. It's of my personal opinion that the consensus of needing a helmet and a bar light is born from dealing with primitive optics for years and years. I know I'm personally building this light so that I will never even have to think about using a helmet light. BUT I am not going to discount developing my own helmet light as I've got some ideas on ways to improve those. High beam is indeed a tricky thing to do. I have ideas for a future light for road use that can do this, but this current lamp will be essentially a "low beam only". However the peak lux of this low beam at 10' is over 1700 lux with a 1500 lumen source, in a 12* wide hotspot. Which is just about as bright as a high end newer LED headlight hotspot. Essentially what I am getting at, is that the distance that you will be able to see on the road, as well as not blinding oncoming traffic when aimed properly, is going to be further than almost anything that's been produced. I look forward to trying it out on the road in person myself. 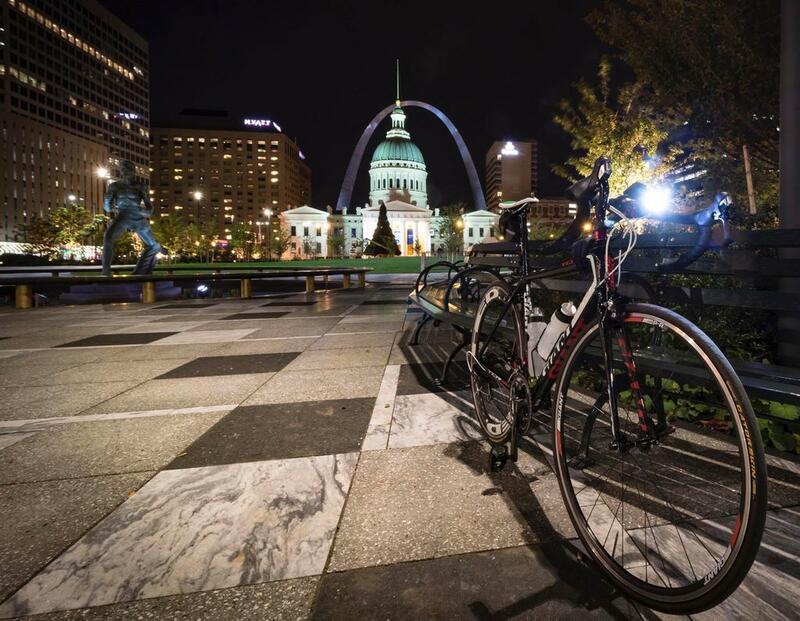 I've done a few night rides on my road bike, but I tend to shy away from doing that as I am not totally comfortable with local drivers on my own, otherwise I have some local downtown night rides with groups of people. ...I do hope that I didn't lead people on thinking that the road and the MTB optic are in the same lamp. They are separate units that are using two different optical reflectors. This is why I am intending on offering both units for purchase on their own at a much lower price without the battery pack in case users want to have a MTB specific light for their trail bike, and a road specific light for their dedicated road bike. I know that some users might use the same bike for both, but that might be a future product where we can make both work (and I know we can). Actually, I did think you were talking about an all in one MTB/Road set-up but I guess that helps explain the two different types of beam patterns you were showing. My personal opinion is that you should primarily focus on the road version. Good MTB set-ups abound and most people don't have a problem finding optical set-ups that suit their MTB needs. When it comes to providing a high beam set-up for the road there really is no reason to have to get fancy. A simple single or duel spot optic can do the trick quite nicely. I wouldn't think it too hard to design a lamp with the main mirror optic supplying the low beam and then perhaps including a couple simple single LED spots in the upper part of the light to provide the high beam throw when it is needed. This said it would be nice if this high beam section had a separate "tilt' feature that could allow the user to aim the high spot beam for maximum effect. Once again, a remote that would allow the user to activate a high beam when needed would be excellent. Regardless of everything I just said about what I'd like to see in the future, right now I would be super happy with a road lamp that provided the beam pattern I mentioned before but yet bright enough that perhaps ( when in it's brightest mode ) an extra lamp for high beam might not even be needed. My current road low beam lamp has a maximum output of near 500 lumen. This actually works very well for me 90% of the time but when I hit a long down hill and my speed picks up I kick in the extra lamp if no oncoming cars are coming. Since the extra lamp has a remote It's super easy to turn it on or off with one quick push ( Gemini Duo with duel spots and wireless remote ) My current road lamp is the Raveman CR-500. As a single optic lamp It supplies a very nice wide even beam pattern with sharp cutoff. These will be one of your biggest competitors because they are upgrading their lamps and so they will likely be better than the current selection that they presently sell. In the future I look to be reviewing one or two of the newer Raveman lamps whenever they are released. This said I don't show product favoritism unless it is well earned. Competition is always welcome....Make it better and they will come. There actually is some really trick optics being used in automotive stuff for compact high-beam like optical parts. One hint is to look at the newest Cadillac esclade headlights. The trouble with it is the high tooling costs. They require optical grade polishing (SPI-A1), but we have been locating some more high quality suppliers who are getting the job done despite stringent requirements. Then a matter of chip selection and packaging. It's definitely in the future planning though! I'd absolutely love to have a "do everything" kind of light, the real undeniable challenge will be to make it outperform everything and not end up being $500. The economies of scale make it harder. Hence why we are starting out with more standalone lights to get established, let people know what good optical systems can be like when they experience them in person, and then build from there. If really interested in finding out more about automotive optical design, or more generally whats called Illumination Engineering as opposed to optical engineering (since that focuses on telescopes, camera systems, and not illumination) then I'd suggest trying to find these books. 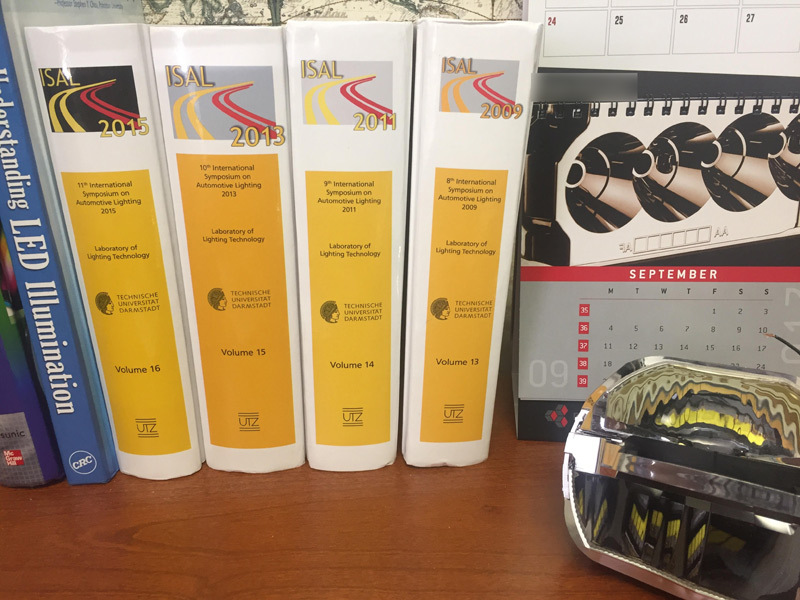 Basically a collection of whitepapers published by various companies every 2 years. What is really cool is that a lot of new automotive lighting systems are trending towards making ultra-efficient optics due to the wave of electrical cars coming. Figuring out how to get the most out of a limited number of lumens, yet still provide enough lighting for a car to hit the highway at 80+mph. While also reducing system sizes due to styling requirements. All of this stuff can trickle down to bicycling as well! We are starting to put stuff together for a kickstarter we are planning on running in a few weeks. The product will move forward irregardless as we have some local shops who are willing to stock it and help us promote. Though we want to reward the early adopters with a discounted light to help get it in the hands of people quickly so we can get some reviews out there! Will be 100% waterproof. Will have to determine the depth rating, but should have zero worries about removing it when hosing your bike off, or to put it under a faucet to clean the mud off of it! Very interesting project, very different than all others we can usualy see. This I would call inovative! - how/where do you place leds against reflector? How many leds? - isn't magnesium worse than aluminium in heat transfer? - how do you get so high electrical efficiency? - what connector do you use? I doubt you normaly use DC5521 connector,very likely planned only for separate light head? there are many more, but enough for now. Thanks. 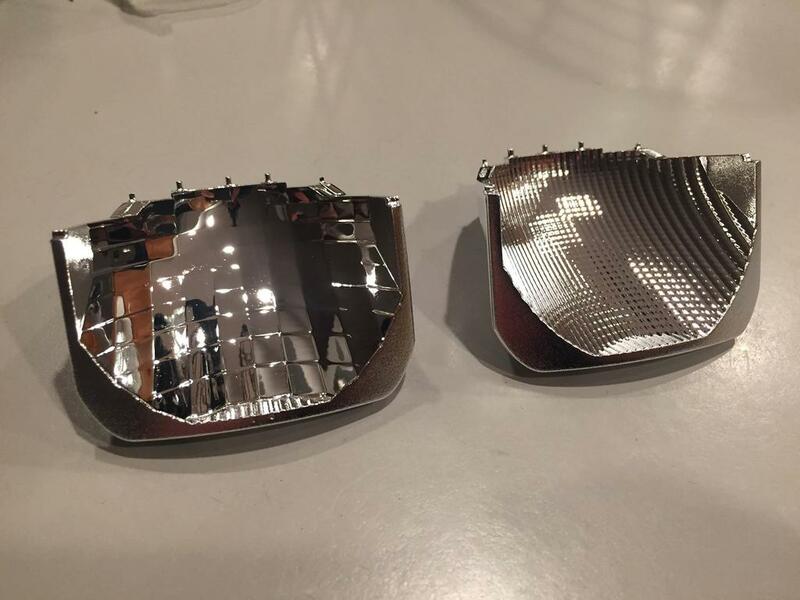 I understand to some degree the difficulty in creating the reflector shape and the cost of tooling to build those reflectors. I've always been intrigued by shaped beams since seeing the Phillips Saferide. I've cut commercial parabolics at varying dimensions and rigged them on my "test bench" to see the resulting beam shape. None were good enough to pursue building a housing around. I even machined some aluminum parabolas on my CNC and polished them with what I had on hand. Again none were promising enough to try to build into a light. Short of having some optical design software (or even any real knowledge of optical design) I decided to quit wasting time on those experiments. Ever since my bad experience with NR halogen lights pushed me to start building my own LED lights, I've never considered buying a "commercial" light. If this Outbound product comes to fruition, I may have to reconsider that. 1. The LED's are sitting around a focal length of 7-8mm. The OSRAM and the Lumileds LED's are what is considered "5 die", so 5 tiny little LED's put into one package. The size of the chips are around 1mm on each side, the tiny emitter size combined with the large lumen amounts means a VERY high luminance value, or the brightness of a chip. This is why they are used in automotive lighting and not chips like the CREE XML2 or any X-lamp series. This is a picture of one of the raytraces from the side. Don't infer anything from the direction and stuff of the rays, this is from an older revision of the reflector that I had prototyped and realized I wanted to make more changes. 2. You are correct that from a pure numbers standpoint, die cast magnesium is 'worse' than die cast aluminum (about 25% reduction in thermal conductivity). 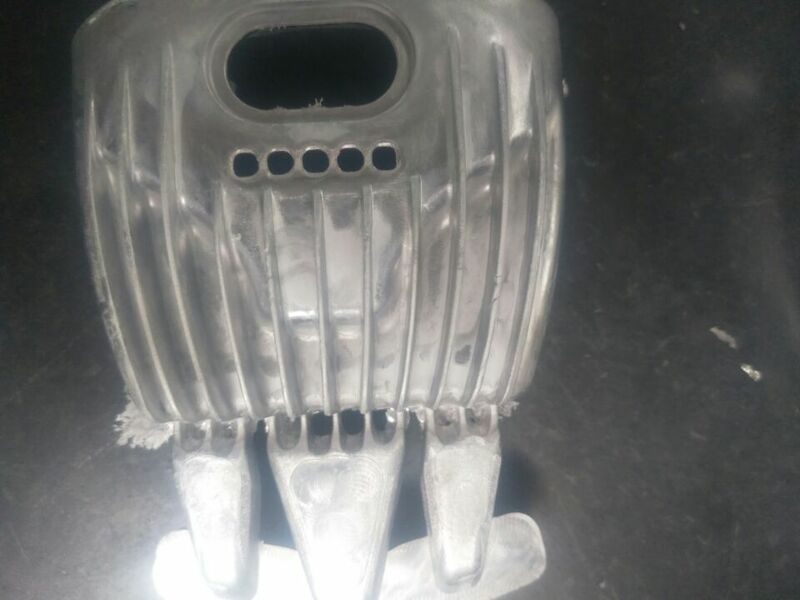 However when you can engineer a heat sink to optimize the fin height, fin thickness, and more importantly are in an environment that allows for high convection, such as sitting on a bike handebar, then you can make a magnesium heat sink work as well as an aluminum one, but without the weight penalty. This is why a lot of OEM automotive lighting is moving towards magnesium heat sinks with either ducted air tubes, or fans inside the headlights. 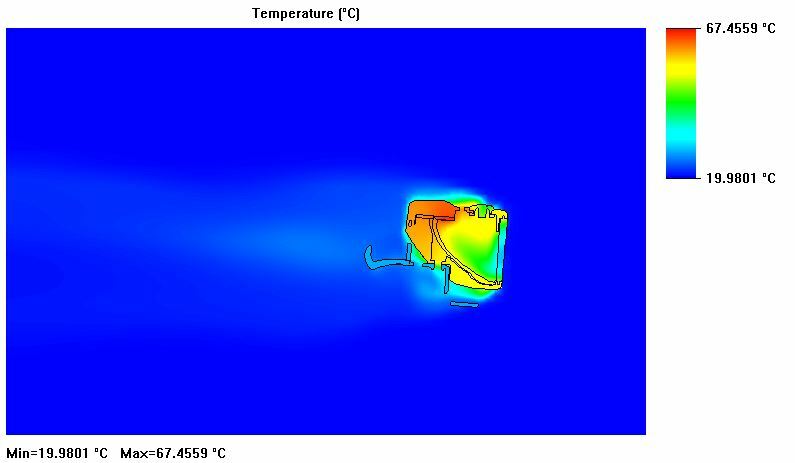 I had run simulations while developing the product to go between aluminum and magnesium, mostly as a sanity check. But when switching just material properties in a simulation, the aluminum ends up only being 1% better as far as the reduction in temperature at the LED junction. However the weight increase would be almost 50% since you can't do the thin features in aluminum that you can get away with in magnesium. This is why the board, the thermal interface, and the heat sink design matters far more than the heat sink material. We are planning on using copper core, or potentially ceramic core. Ceramic is a fairly new tech being introduced in headlighting, the cost is higher, but since the actual MPCB size is fairly small, we might be able to make it work within our cost structure. 3. Asked my electrical engineer your question: "We are using a high quality DC/DC switching boost controller designed for efficiency at it's core (MP3431GL-Z). This coupled to an ultra efficient LED lets the battery generate more light and less heat. It might surprise some people that it is a voltage controlled chip, not current.... we are controlling the current by controlling the voltage. Gives us very tight control of the actual current in the micro." It helps that he's been doing this stuff for years, but more on the motor side in high power RC electronics. 4. Right now we are indeed planning around a DC5521. I want the ability to use older battery packs one may already have laying around. Almost half of our cost is in the batteries themselves. So if I can offer a cheaper light to get more people interested by saying they can use their old battery packs then I think it's worthwhile. We won't lose or gain more money either way, and I think just helps make the price of entry a lot more enticing ($135 vs $225) to get more people experiencing the power of a good lamp. Yes, thank you. Things are more clear now. I didn't think of using 5 die led. This would be somewhat similar to 5 Cree XP-E just on same base. Obviously we are quite limited with our knowledge and you have experience in automotive world which is different on what we are used on. So it is OSLON KW HLL531.TE or KW H5L531.TE ? Anyway both have same size of 5.5mm2 radiating surface but bit different forward currents. With typical Vf 15.1V you need to step up (boost) the voltage from 5-8.4V range. This would need high current flow if I understand things correctly. That's why I'm skeptic about DC5521 connector. Will try to find datasheet about MP3431GL-Z chip. The Altilon or the Black Flat would be more in line with the new CREE FX series that is being made in response to those. The XP-E is "smaller" than the typical CREE, but with the domed primary optic, it is trying to create a bit more even illumination suited more for architectural lighting rather than an "open die" where the relative intensity curve is suited more for directional illumination. The extremely high brightness is key for highly optimized optics. This is why lasers were pursued for a bit a few years ago for high-beam lighting (BMW and Audi both touted laser lights for their cars for a bit) because the intense laser point creates a very high luminance. However in the last year or two the luminance of LED chips quickly are catching up to laser to the point laser lighting is almost done away with. Neat novelty for a bit, but the extra cost and compliance measures just wasn't worth the small performance improvement. We started testing with the HKL531.TE, and may still go with that just pushing it a bit harder, however if my SMT supplier can get their hands on the Altilon SMD in the 5-die configuration for a good price we may go with that just because the lumileds are something I am a bit more experienced with. I use the ZE S chip in a lot of applications for the work I do in my other job, and know they are just powerhouses. The lumiled stuff can take a thermal beating well beyond their ratings and just keep trucking. It also is nice the Lumileds rates their stuff at a "normal" operating range rather than cold like OSRAM does. Downside is that unless you buy 50,000 of them at once, it's veryyyyy pricey. Was able to secure a supplier for the OSRAM chips however. Both are extremely similar in performance, so it's really going to come down to availability. As for the DC5521, most of them are rated for 220V and 6.5A. So with the chips pulling around 13-14V and at most 1.2A we don't really have many concerns about the connector itself. Despite the increased performance, these will be running less total wattage than a typical high power light. That's one of the exciting things about this. 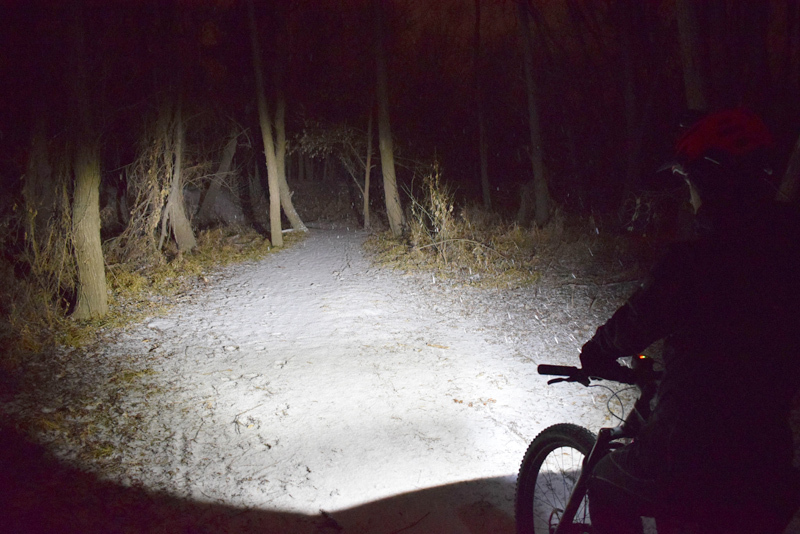 Even if we run at 1300-1500 lumens, it will have the same light intensity, but more width and even illumination than something like a NiteRider Pro 1800 lumen, except twice the battery life because of the efficiency we are introducing. Especially if users try out the adaptive mode that very slowly reduces the light output as your eye gets used the surrounding light so that you can eek out another 40-50 minutes out of the battery pack instead of just running a solid "high" all the time. I couldn't get datasheet for MP3431GL-Z chip unless I register as a company at Monolithic Power System. Can you provide it on private at least? For Lumiled 5x I've found Vf 15.7V @ 1.2A (85°C) so close to 19W while Osram 4x has Vf 12.2V @ 1.2A (25°C) thus only 15W. We need to add some power for driver and loses in wireing. This would lead to 3-4A from battery on highest power if we simplify calculation and take up to 24W as its worst then 6-8V from battery gets 4A down to 3A if driver is regulated. Don't know what connectors you can get, but I'm shure those Chinese ones has quite big resistance. Did not measure it, but on Zanflare B3 light I've meassured 0.38V drop from battery to the driver at its higest power @5A and about 0.20V @3A. That's why I'm concerned about those connectors. I don't think 60 lux is enough. I use B&M dyno lights with cutoff beams, similar to the beams you're proposing. They went from 60 (Cyo) to 80 (Cyo premium), now 100lux(IQ-X). Thats for road riding, you probably want more on the trail. PS. I couldn't found anything about Cree FX series, only annoucement about new NX technology and XLamp XD16 which can't find either. Correct. What I was describing was 60 lux on the ground at various distances for consistent bright lighting. They rate their lights as peak lux at 10m looking straight forward typically. For the same measurement the trail version will have 80+ according to simulations, and the road version will have 140-150+ lux because it's a bit more concentrated beam due to the cutoff. For comparison. The Niterider pro 1400 measures a peak of 65 lux at 10m. The Ion700 measures 60 lux (much narrower hotspot concentration than the niterider, so similar peak lux, but half the lumens). But have to remember that peak lux isn't everything. Some of the chinese lights have peak lux of 200, but the beam is so narrow that even on the road it's hard to use. So have to balance power and width. I can request the datasheet it from my EE. He's been working with the connectors we get from battery suppliers, and from lights I sent him to evaluate for performance, so have been doing all the calculations based on the DC5521 connectors, doesn't seem t have any pressing concerns about them. I won't try to correct any numbers as it's not my specialty, but I'll ask him about them. Do you know how long the zanflare wiring was? Yes this is all I could find at the moment. Will have to wait and see what's all about and what influence will have for us (targeting on cheap solutions, to be honest). Zanflare B3 wire is not a problem at all. It is 16AWG, so even quite long should be good. Actualy it is rather short about 25-30cm. On the battery side it was 0.5m long 20 AWG (1m extension wire cut on half), so not quite long either. Thought I'd throw some pictures out of the design process. No fancy industrial designed digital sketches here. Started with me just quickly freehanding some ideas I had floating in my head. 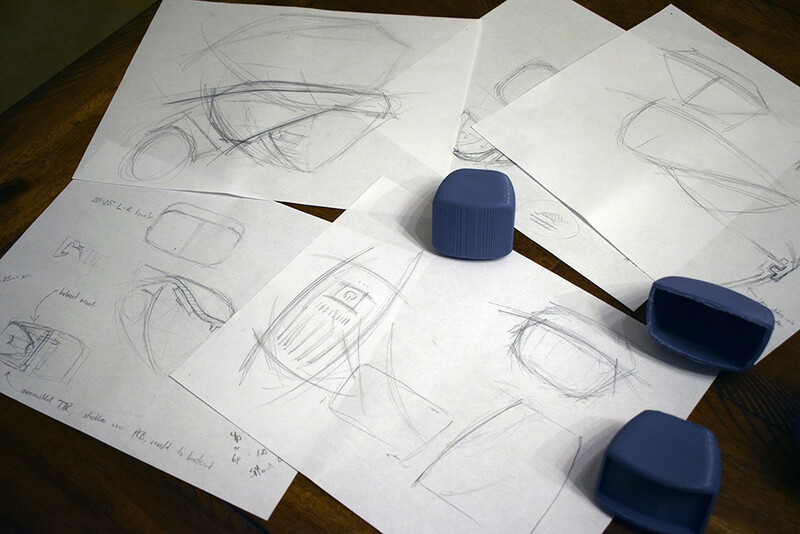 Then got to modeling in Solidworks and printing many many many basic shapes to get an idea on size and form factor. From there started going down several paths in terms of styling and optical. This was an intense long process that took several months until I got to a design that I was happy with. We then got parts machined and powdercoated so that things could be tried out in the real world. Since then I've made several more styling changes as you guys have seen in the renderings. Inching towards the production part samples and electrical. This is the period of development where things slow down a bit as we wait on suppliers to cut tools and get parts shot. Takes anywhere from 30-45 days. I am very interested in your road light. I am so glad someone in the USA with your extensive lighting background is taking on this difficult task of building a quality on-road bike light. As there are few well controlled and bright on-road lights, your offering should be a very, very good seller at approximately $135. You are in direct competition with the Supernova M99 series which are way more expensive. I was planning on purchasing a Lupine SL-A in November but will now wait for your light build. I presently use a custom built externally powered Philips SafeRide that produces 127 lux at 10 meters on high. I rarely use high except on newly paved pitch black roads or when caught out in the rain. The efficiency of the TaskLed driver is only 85% though and having a new light with higher more evenly distributed lux numbers hitting the road would be welcome for all conditions. Also the Philips beam width is a little narrow at -25 to +25. I look forward to seeing some good outdoor photos of the road beam pattern. 1) Since the Oslon Black Flat led array has the negative terminal as part of the base led heat sink, how do you plan on electrically isolating it from the magnesium body? By using a non-electrically conductive thermal pad perhaps? 2) How many light levels are you going to program in your led driver and will they be user adjustable? Lupine only has 2 non-adjustable levels and 2 modes in their SL-A light which I think is a severe limitation. The CEO of Lupine doesn't believe it's a limitation though. I have to agree with Cat-Man-Do on the off-road version not being your primary sales focus though. There are a lot of very good off-road light head only options between $100-200. 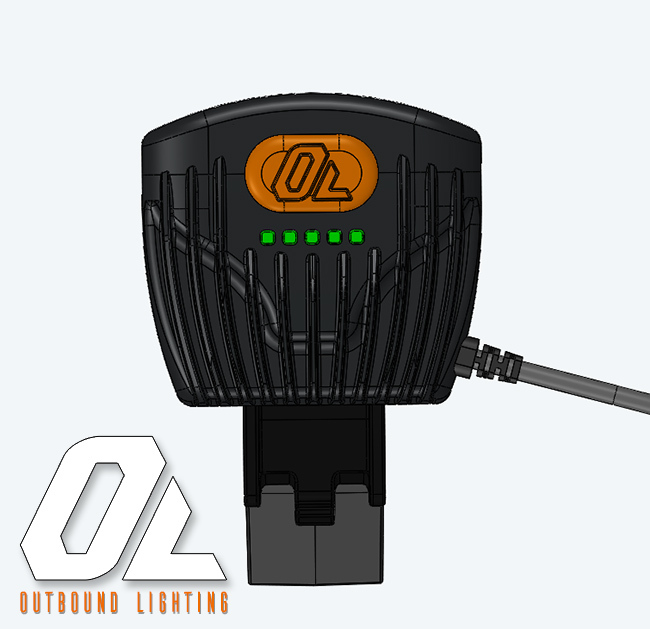 The light beam control for off-road can be a lot looser and still be useable than a true on-road light. I am nowhere near as picky about my off-road lights as I am about my on-road lighting. Thanks for the photos of your design process. You also have some really innovative ideas in your proposed light. 1. I can't speak too closely for the electrical isolation, but that's never been a problem for any metal core board that I've worked with. Whether a thermal interface material was used or not. So I assume the engineers are doing something with the masking and such to isolate. However we will be using thermal interface material irregardless. Having a thermal pathway from the LED to the heatsink is absolutely critical, so will be using a high quality TIM that we use in LED headlights that I design at my normal job. 2. Right now planned around 5 or 6. High, High-med, medium, low, slow pulse, and an "adaptive" mode that basically starts out on high, and then very slowly reduces the power down as your eyes start to adjust to the light. Physically it'll feel like the light never dimmed, even though we can reduce power by 15-25% before it becomes noticeable, which will help prolong battery life even further if the user chooses to do so. As for the user setting their own level preference, we don't have any plans on doing that for now. Though if you have any suggestions on how to do it without bluetooth and with a single button, I'm open to ideas. I personally haven't used a light where I felt like I needed to customize the light levels, but generally I just go to high and see where it goes from there. Thought I'd also show you guys another thing I've been working on as I prepare for this kickstarter campaign. Pretty neat interactive 3d model that lets you check out various annotations I've setup and such. I think it's cool. Hopefully you guys do too! "My Bike Lights" Thread on BLF teardowns, measurements, and beamshots. Moving my photos, PM or post up if you can't see them. 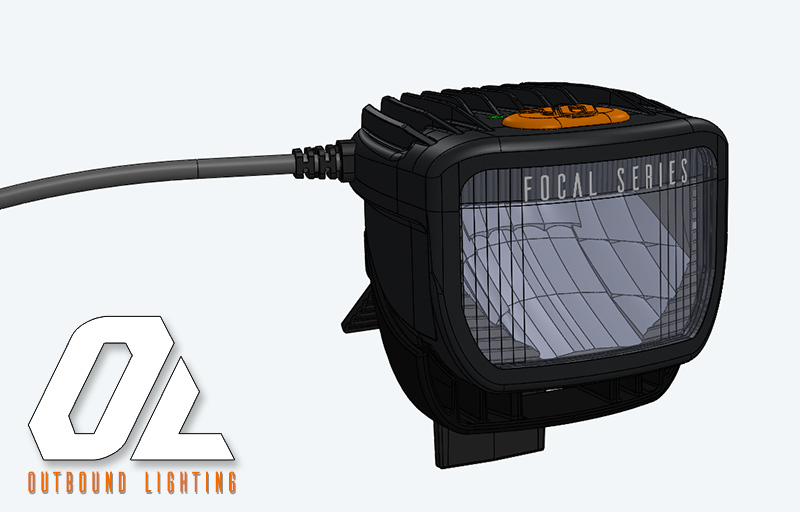 Very nice 3d demo model of your light build. It is obvious you're a professional designer. The proper user interface for a bike light is high on the list of desireability. Such as no strobe or pulse in the normal low-med-high rotation. The desire for programmable light levels stems from wanting to optimize for battery life and personal riding style. Everyones night vision ability is different. 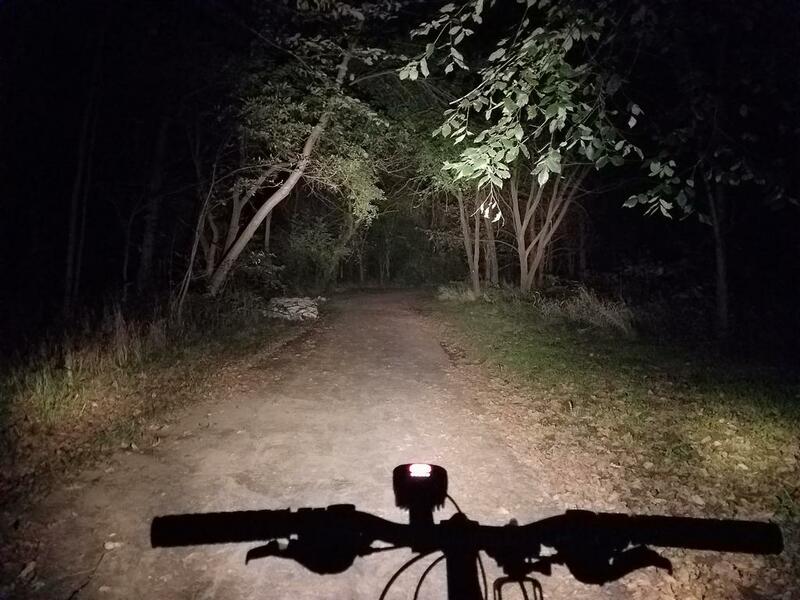 While road riding, I like to retain as much of my natural night vision as possible so I can enjoy the great outdoors as part of it. Otherwise I might as well just stay inside and ride my boring trainer for exercise. I have been road night riding 4000 miles a year with a true cut-off beam light (custom Philips SafeRide) for the last 4 years. It has a total beam angle of 50 degrees. As an ideal light level program I settled on a 27 lux low beam, 78 lux medium, and 127 lux high level. I ride in California, Arizona,Texas, and Michigan during different seasons. If your Focal Series light has about 30 lux low, 80 lux medium, and over 130 lux high I wouldn't desire any custom levels at all. On back roads with little traffic I use the low level but bump it up to medium when there is traffic. These lux levels are measured at 10 meters at the top part of the beam which is the brightest area. I can't program this light while moving as the custom program mode has way too many options. My favorite programmable interface is on my off-road only Gemini lights. I can program this light while actually moving. The following is the Gemini interface. To switch the light ON, press the button. To switch the light OFF, press the button for 1s. To cycle through the different LOW, MED, HIGH modes, press the button repeatedly. To enter FLASH mode, start in the OFF position, press and hold the button for 1s. The makes the flash mode hidden. LOW, MED, HIGH, FLASH modes are all programmable. 1. Navigate to the selected mode and press the button for 3s. The light will enter programming mode and output 10% brightness. The back lit button on the light will begin flashing amber indicating the light is in programming mode. 2. With each click of the button, the light cycles through the 10 different brightness levels: 20 - 30 - 40 - 50 - 60 - 70 - 80 - 90 - 100% . . . 10 - 20 - 30% . . .
3. To save the brightness level and exit programming mode, press the button for 3s. The light will turn off and on again to confirm the change. My least favorite programmable light is my Gloworm XS because it is too easy to double click the interface button and unintentionally go into program mode. This kind of user interface has also KD2 light just a bit different timings. See post #16. I agree it's one of the best user interfaces out there. Your discussion of the user interface is very well explained. I think cat-man-do also has commented in the past that he liked that style user programmable interface. I am discussing the light levels of the road version below, not the trail version. Someone else needs to measure and respond to Outbound for the lowest useable off-road levels. If outbound has about a 30-35 lux low beam for the Focal Series and well spaced out upper levels I would still be satisfied without custom programming. A 60 lux low beam would be a waste of battery and also a little too bright for me to retain good night vision. Most street lights are just a little dimmer than my Philips SafeRide at 30 lux low beam. My eyes don't have to re-adjust to the dark every time I go through a neighborhood and back to an unlit roadway at 30 lux. To me an easy to use mode button is the first thing I consider when judging UI preference. My favorite lights to use (all my Ituo lights, C&B Seen 7up, 2017 X2 and my BT21s) all have mode buttons I can operate reliably with one finger. Least favorite lights to use (Taz 1500, Duo, Yinding) have either hard to press mode buttons or ones that have poor feel leading to poor mode switching performance in both cases. Great Gemini programming is sabotaged by duo's hard to use mode button (not a problem on the Olympia or Xera) or frustrating inconsistent mode changes and unintentionally entering programming mode is eliminated (for me) by Gloworm's new "better feel" remote button making it a much friendlier light to use. Mode setting preference for off-road has to go to the C&B seen used in its programming mode. Rapid multiple level changes are made easy by the 2 button wireless remote. Still prefer programmable presets for road use but just a high/low is fine for conventional bike lights. With cutoff beam lights need to rapidly reduce light is minimized and extra preset modes for battery conservation is useful. Pretty hard to please everybody without mode programmability but still possible to make most happy with a good mode button and smartly chosen presets. I still have yet to use a light with a remote, but I really want to try one. I've definitely had times where I wanted to change modes, but the riding conditions didn't allow me the opportunity to take my hand away from gripping the bar. I still have yet to use a light with a remote, but I really want to try one. Me also, wireless remote especially. Great discussion guys, I really appreciate it. You'll be happy to know that I totally agree on an easy to use button being critical. I'm really happy with how ours turned out. My electrical engineer sourced a great feeling switch and it works well with the oversized silicone button I designed. 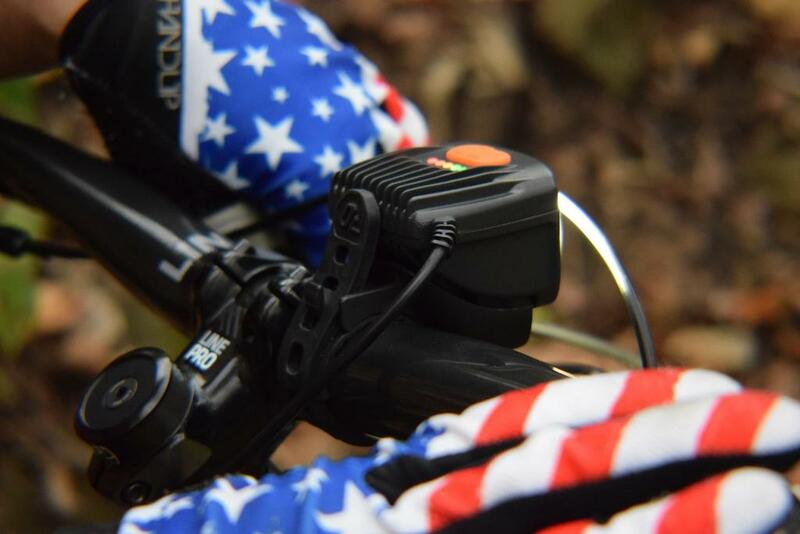 Very easy to press, firm feedback, and can press it easily while riding even on a trail. I have a meeting planned with my engineer doing the firmware to discuss a more finalized version of the programming. I am definitely taking all your points into consideration, brought up some great ones. May have to snag the gemini for myself (one of the few I haven't yet) and check out that programming. 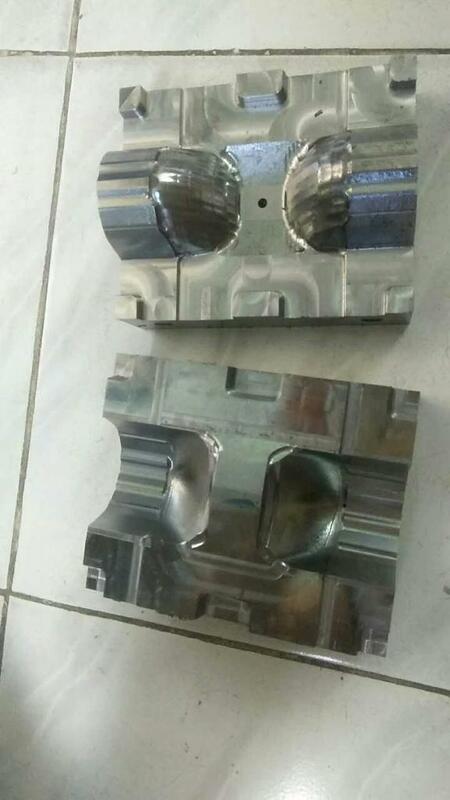 We've gotten some rough machining shots from our supplier for the diecast and the reflector. These are the first passes they do before its sent for higher precision on machines with more toolheads. In the case of the reflector, it has to go to an EDM shop to get the very fine reflector faces precision machined. Wouldn't be able to machine and then polish reflectors this small. EDM is fantastic (but expensive) for getting this tiny detailed features. What about remote? This will be a very important control feature. Two keys would be perfect, one for + and one for - for example. 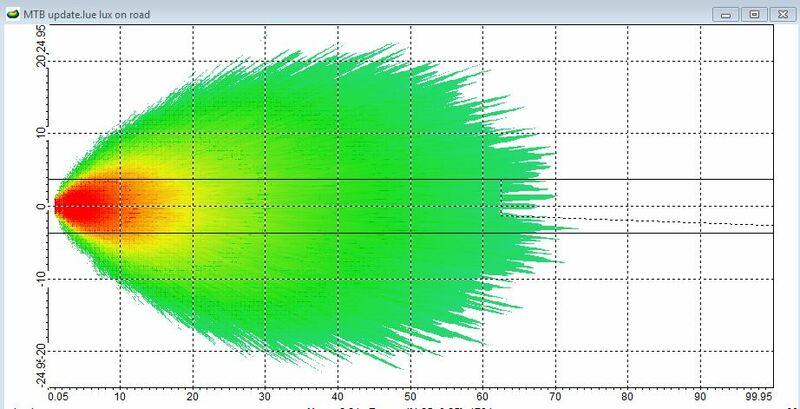 And do you have some beam diagramm like this? Unfortunately no remote right now. I won't rule it out in the future, but right now sticking with the mantra of KISS. Focused the efforts on a great beam pattern, long battery life, total waterproofness, and ultra reliable electronics with zero soldered joints. why not have a thumbwheel for continuous light level adjustment? That'd be pretty tough to weatherproof, and to be honest, at least for myself I often just find one light level and stick to it. If battery starts depleting I'll step it down (or have the software do it for me). More things to focus on when riding than the light level! ok, well how about + and - buttons to adjust the light level, so we don't have to memorize morse code. It will have 5 status lights that will indicate which level you are on. I agree about hating having to click through half a dozen times to make sure you are on the highest level. How about an update on how this project is going? It has had it's up's and downs! So was sort of a lull as I waited on a few production samples of some parts and the electrical engineer whipped up some more prototypes of the control boards and the MPCB. Got some samples of the reflectors. Made pretty much dead on to what I had designed, and was reaching the power levels and spreads that I expected, however there was a dark spot in the beam pattern that should not have been there, and too much light lower in the pattern. Did a lot of measuring, simulation, and was able to validate that the aluminized plating pooled up a bit on a few particular faces based on how it was sitting in the vacuum metalization chamber. The extra thickness (0.2mm) was enough to push the facet out of angle, and create a hole in the beam pattern. Not too happy about that. So the manufacture says that they'll fix that, we'll put quality checks in to make sure more consistent plating thickness. However taking this opportunity to refine the beam pattern some more, and make a more robust reflector surface that won't be as sensitive to slight manufacturing issues as the prior one was. The company doing our reflectors work extremely fast, so hoping it won't affect our timeline too much, as the current long-lead item is the LED chips themselves and the silicone lenses. The electrical engineer did pull out his mountain bike that he hadn't used in years and finally got riding again after I sent him one of the prototype castings and a prototype lens. He had a blast, and took a few pics. Remember that this is a very early prototype reflector. I'll try and get my good camera out and take some pics of the current iteration of reflectors even with the dark spot that we are working out. He had the light aimed a bit too high in the pic, but the key thing to notice is the extremely even field of light from the front of the tire to nearly 50-75' out and the width, even when just taken with an iphone. The second iteration of reflectors added about 5* of width for the hotspot on either side, and the now 3rd iteration of reflector design will make the beam pattern smooth as butter. Wow! That beam pattern looks fantastic! Good to hear things are moving along! It's one of the most interesting projects currently. Do you aim at MTB only or road use with cut off beam too? We have both an MTB reflector, and a road use reflector. The road one has a sharp cutoff and a bit tighter hotspot to get more intensity for those 45mph downhills. How's your strategy during development and for release? Do you think it will be an alternative to the Lupine SL A for example? It looks like a great project and I am interested! Did I miss the kickstarter link, or is that still in the works? I do believe it will be a good alternative to the SL-A. It will have a well defined cutoff and a bit more width and "softness" to the edges of the beam pattern as a result of being a reflector based design rather than a lens based. Early pre-production reflector tests weren't quite as good as I hoped, so redesigned the surfaces and having the supplier redo them (at my cost, boo, but that's the price of development). Haven't missed anything yet! We had originally had the goal of doing a kickstarter at the begining of October with an early Nov launch date. We have pushed it back a month since a redesign of the reflector is needed, as well as the LED's becoming a long-lead item along with the silicone lens. So now the tenative plan is to launch a KS in November, and hope to deliver the first units in early December. We will be assembling everything here in St. Louis, so this product will be truly designed and assembled in USA. KS in nov and delivery in dec sounds very fast. Hope you'll collect enough founders in this short time! How about the light distribiution, the Lupine SL has some bright area close in front of the bicycle. This result in lower visibility for objects in the distance, since the eyes try to adapt to the close bright area. So for street use a homogenous illuminance level or ascending towards the distance (until the cut off) would solve this topic. And which CRI do the planned LED chips have? Good to see you're using an DC 5521 plug. In case of limited space, a solution for mounting underneath the bar (instead of on top) would be useful. Also solutions for fixed mounting as well as fast attach holders for quick detachment in urban areas (while maintaining the exact position/alignment of the holder). Check out the preview pic on our facebook page. The beam patterns are specifically designed to have an even pattern from the front of the tire to far out. It's tough to do without software, but we have it. 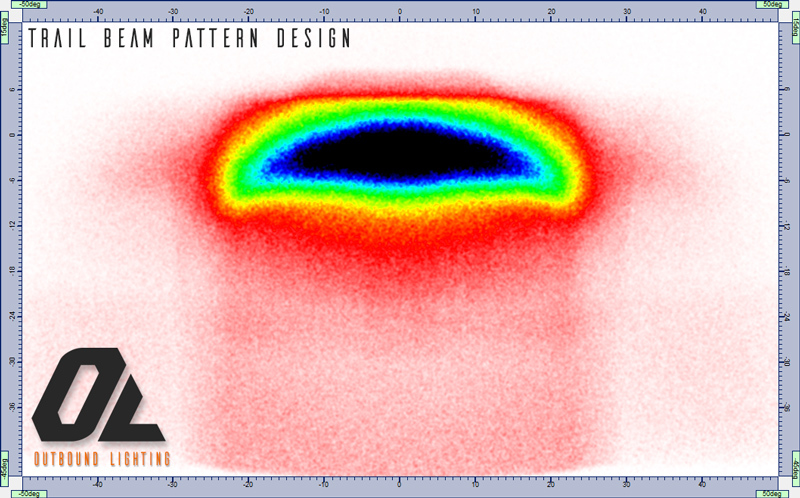 I cover the design aspects of the beam pattern in the "Optical design" on the first post. As for the kickstarter, we have already paid for almost all the tooling, we don't "need" the KS funds to make the product happen, it is more of a reward for early adopters to get deep discount on the planned retail pricing as well as to help spread awareness. The chips aren't rated by CRI because they meet the SAE J578 standard which regulates the white color range that is required for automotive use. We will be working to try and get the 5500K color range of chips, but really going to be more based on availability and what has the lowest lead time. Some chips are in stock and can get a reel within a week or two, others have a lead time of up to 8 weeks. The quantity numbers we are working in means that more at the mercy of what's available since it's an automotive qualified chip, not just a typical off-the-shelf-cheap-CREE chip that suppliers have thousands of. 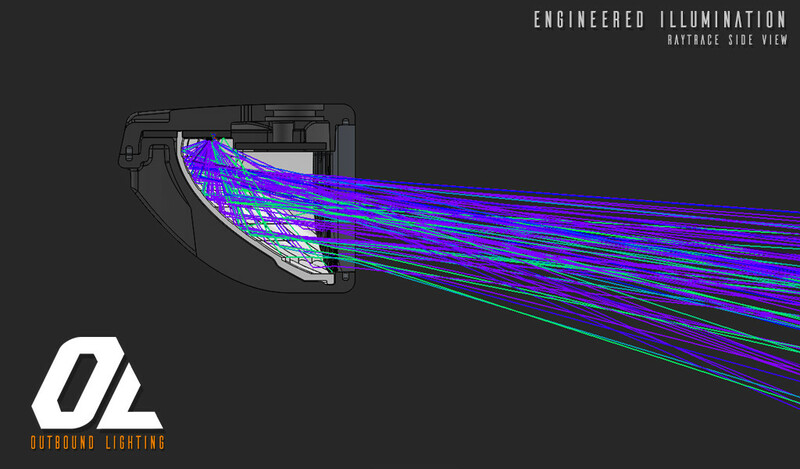 Here is an updated comparo showing the Trail beam pattern that is getting updated. Eagle eyed readers can probably spot the issue I am correcting, but this is a general idea of what to expect. This also does not include our silicone lens which will act as a horizontal diffuser further softening the beam pattern. Switching to larger more overlapping facets on the reflector design is also going to help solve the "choppiness" of the beam pattern. Though noticeable when static, I find it hardly perceivable in motion. However I know we can make it better, so we will. This is comparing to the typical tight beam pattern found on a lot of the cheaper lights out there. I had a buddy who bought this light and swore up and down it was great, so I grabbed it just to show off what we got compared to what he thought was fantastic. Really looking forward to the next round of reflectors, which we will probably have in a few weeks. We are waiting on the hard plastic and silicone production samples to arrive, as well as the magnesium die casting components. Those parts I am insanely excited to see. Looks pretty good! Will keep my eyes open for the Kickstarter. ........This is comparing to the typical tight beam pattern found on a lot of the cheaper lights out there. I had a buddy who bought this light and swore up and down it was great, so I grabbed it just to show off what we got compared to what he thought was fantastic. That tight spot is a pretty nice looking beam except for being a bit "ringy" in the spill area. Every light I've built has been with a goal of getting a tighter beam with a sharp transition from lit to dark. Every time I've ridden with a wide beam I find it makes weird, eye catching shadows out to the sides of the bike. Too distracting for me. At 50' out, if it makes a lit area wider than ~15 feet, I'm not liking it. If I need to see around a tight bend, a switchie or something, that's what my helmet light is for. It lights where I'm looking and bar light lights where the bike is currently going. Not the typical preference of most folks though. I'm mainly intrigued by the down firing LED and not having "wasted" light shining upward as happens with conical beams. That is an interesting perspective. I know I've never felt distracted by shadows while riding with a wider beam. However I do hate the "flood" type of lights which just throw a wall of diffused light in every direction. Generally in my measurements and experience, a 90* total beam spread (so +/-45* from the center line) is just about right to see into faster corners while not being too distracting. Hence that is the beam pattern I aimed for. There is no reason to be lighting 90 degrees off to your right on a bar mounted light, that will mess with your peripheral vision. What kind of trails do you ride? Mine range from really tight technical slow stuff, to mid-speed flow type trails. Not much high speed downhill. Though occasionally have the faster stuff through open spaces. I'll be genuinely interested in your take when you get your hands on these. Isn't Magnesium a terrible heat conductor? ......What kind of trails do you ride? Mine range from really tight technical slow stuff, to mid-speed flow type trails. Not much high speed downhill. Though occasionally have the faster stuff through open spaces. I ride a wide variety. Trails closest to me are fairly tight and usually with moderately heavy underbrush close in. Often wet and kind of shiny when lit, particularly this time of year before the leaves have all fallen. I do ride some trails that start or end with logging/fire road or rail-to-trail sections. The logging/fire road sections are sometimes kind of steep and make for 25-30mph runs. I'll kick both lights on high for that! I've also ridden some of the local DH shuttle trails. I'm not much of a jumper to begin with, but night jumps are scary. I try to follow the concept of looking where you want to go. I think that kind of drives my preference for a narrow beam too. When I ride more open trails like around the Bend/Sisters Oregon area, I suspect a wider beam might be less "troublesome" to me as there is less dense brush near the trail. I have done night rides on very open Utah and Arizona trails and have thought the same thing there too. I started night riding while doing some 24 hour racing around 2000. Started out with NR halogens. At 2:00 am and a tired brain and body, things like shadows off to side of the bike start to grab hold of your attention. That's when I started looking for lighting that really just illuminated the trail only, and not the surroundings. Why is it important for the chip to meet some automotive spec? BTW, I prefer higher CRI and a lower color temperature, even if it means the output is a little lower. The automotive standard puts a tighter control on the color temperature allowed, since CRI is a fairly subjective and inaccurate measure of lighting. CRI is really only used in commercial lighting or home goods, sometimes theater stuff. But for automotive specs, it's required to fall within a certain range. The color temperature range will be in the high 4000's to mid 5000's. More of a neutral white. What we do is far more in common with automotive specifications, and they have millions of dollars of research and committees on lighting standards, color temps, driver requirements, etc. that it makes sense to follow their guidelines and specifications. 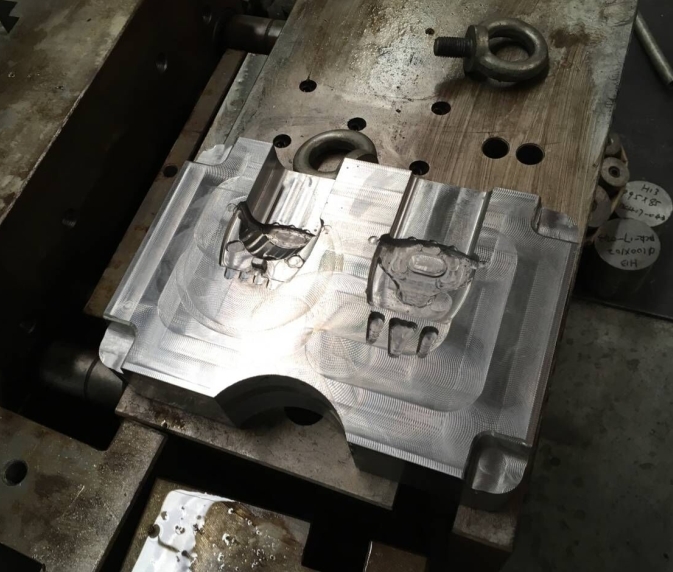 Always a joy to see the pictures of the first tests of the casting molds! These have been deburred, surface finished applied, and off to powdercoat before we have about 20 samples to work with for extended testing and validation. As you can see, the styling changed a bit from the initial prototype, and the thermal improved significantly. Got access to some new software at the other automotive company I work for, and have been updating the reflectors. Really cool stuff, and have spent probably an upwards of 80+ hours in the last two weeks simulating, tweaking, simulating, tweaking, on and on trying to get these things just right. I was not happy with the first production run, so pictures in the KS and other real-world beam patterns will be clearly marked as prototype still. 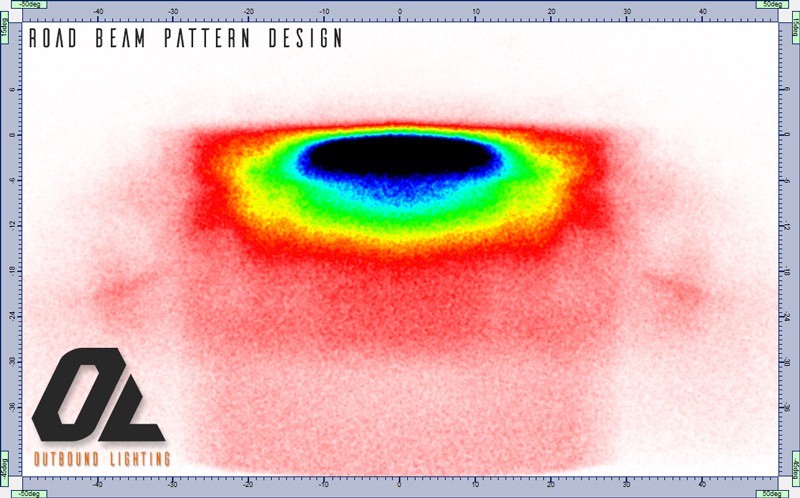 Here's a simulation of the cutoff beam pattern that's been validated in two software sims. Glad to see your new prototype coming along. I look forward to seeing how well it all works in the real world. Now about the issue of CRI; I think CRI was suppose to make comparing light sources easier. Yes, it isn't used by every industry but like CCT it has it's positive aspects. CCT is closely related to CRI and both have reference to the Kelvin scale. It's kind of like comparing the metric scale to the Imperial scale of ft. and inches. Both get the job done but depending on what you are used to working with one will always be easier to work with when compared to the other. Personally I've always favored the Kelvin scale when it comes to light sources but like I said before, that's only because that's what I'm used to. It's also why a lot of industries still use it. If you look at the article on Wiki that talks about CRI, it seems very apparent that both CRI and CTT are quickly becoming obsolete. More newer definitive scales are evolving every day as the science becomes more technically definitive. Of course even if a universal scale finally does comes to a final point of universal acceptance, a person who uses the scale is still going to have to compare the scale to what his/her eyes tell them is the best...and so it goes. Still, when the day comes that you can place an order and tell the person taking the order, " Oh, I want that in a UCC ( Universal Color Code ) 0152", "Last time I got an 0175 and that was a bit too cool", by that time I'll likely be dead and gone. I agree, more or less comes down to personal preference. I think CRI is a great thing to think about in a home when mixing various light sources like a halogen bulb and an LED bulb so it's not so obvious when walking around that there are different types of light sources. I always pay a bit more for the higher CRI when I install new lighting (my house is also basically LED heaven... my wife doesn't understand why I go through such great lengths to get good lighting. ). Thought I'd show off some more of the beam pattern and prototype use. I am fairly happy with how they look in pictures, obviously not capturing a lot of the spill light that you often get from bounces and just general low light with a camera, something I think all of you understand. I was lucky enough to be able to test things out side-by-side with a new $430 Seca 2500 race and decided to make some changes after riding a lot with both lights separately. What I ultimately found is that peak lux was not an issue at all (Seca 2500 had a peak of 58 lux at 10m), what I really wanted was a little more width and smoother beam pattern. The Seca is a really well made light, will never knock it as being bad, fantastic for singletrack and fast trails. What was the key difference? Very smooth blend of light, could hardly tell where a hotspot was and that made all the difference when riding. Your brain isn't trying to work overtime to readjust for a constantly moving hotspot and instead can pick up lots of objects in the periphery. The biggest change I made was to add another 30* of total beam width. This takes things from an initial 70* of beam width with to nearly 100*, while stretching and smoothing out the hotspot zone. What this does is result in a lower peak lux number, but makes for a far more usable light when actually riding and moving. It also helps to smooth the light out so the area where light starts and stops is less defined, making for an easier riding experience. New reflector looks good, not to bright in close distance so eyes can focus on the distance without beeing disturbed by close distance brightness. Do you have an bird view brightness diagramm like this one from B&M? Thanks for the updates, looks good! So this might not be a direct comparison since I don't know what scale they are making assumptions at. So I just chose a 60 lux ground peak, even though I know they are talking about their 60 lux light. But here are some quick sims I did and screenshots. Same scale as the IQ (40m distance, and +/-15m left and right). I think one of the bigger takeaways is the additional width earlier on in the distance, aka that 5m width. Have it almost immediately on the road version, and on the IQ2 it takes almost 10m before you have that width. 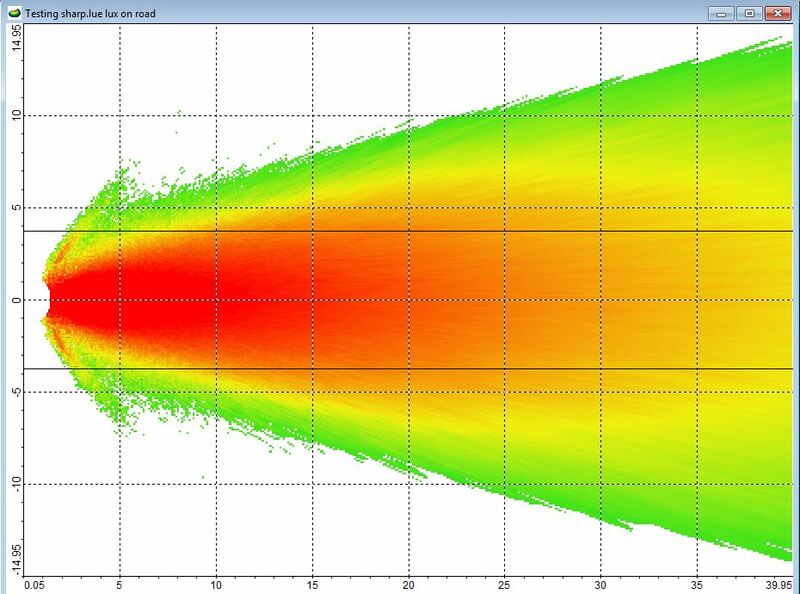 This is the full width beam plot. Normalized at 60 lux, and a 1 lux minimum. Now when most flashlights and other things are measured for "beam distance" they often use 0.25 lux.... which frankly I think is kind of B.S., 0.25lux is moonlight.... object recognition starts to happen around 1 lux of light, so I like to focus on that. When rating "0.25 lux beam distance" you can almost double your actual beam distance.... so be wary when you hear the term beam distance... Anyways, here's a comparison of the road vs trail. Can see how I optimized the trail for much much wider use, and the road is treated more like a conventional car headlight and almost 110 meters of real-world beam distance. Aka you'll be able to pickup objects on a roadway at over 360 feet away! Also for reference, the road has a peak lux of around 150. So this might not be a direct comparison since I don't know what scale they are making assumptions at. But here are some quick sims I did and screenshots. Same scale as the IQ (40m distance, and +/-15m left and right). What do you mean with scale - which color stands for which illuminance? The second road-beam with 1lx at 110m seems to have problem i mentioned the previous post. Much more illuminance from 1-10m in front of the bike than in 50-100m and 20-50m distance. An homogen illuminance distribution between close/medium/far distance would be perfect (for me). So distance visibility in full darkness reduces the more far visibility in fully darkness. That's my experience with riding on leaf planted gravel roads in the forest in early autumn mornings. Currently i use an B&M Ixon IQ Premium for distance (at 80lx power setting) and an Ixon IQ (at 25lx) for close area visibility. So i can detect unilluminated road users early enough and also objects on the surface. At 25km/h (16mph), 30-50m visible light range are good. For 40lx illuminance at most of the beam area and 12° beam angle, around 2.400lm would be needed. So i'm just curious what do you think about it and approxemately which luminous flux you're planning do use with the new road version? Does that mean the kickstarter batch for sale won't get the updated reflector? Also, most of my road riding involves going up a steep twisty road very slowly, and then descending it. I wonder if the road beam will be too narrow for me and I should get the MTB instead (an add an upper beam cutoff for the flat segments of road shared with oncoming cars). The main issue being that since I go up so slowly, there is a lot of swaying and twisting the handlebars back and forth, and thus the beam keeps sweeping around. That does sound confusing doesn't it? What I meant to say is that the stuff we'll be using to shoot video and pictures for the KS won't be the updated reflector and will be trying to make that clear. Absolutely will have the updated reflector for the kickstarter backers. As for the road, I think it'll be wide enough IMO. Angles and distances are sometimes pretty hard to get a grasp on without going out and measuring in the real world. Take a look at those bird eye plots, and go measure out 10 meter (30 feet) with a tape measure, mark it, then go 23' to your left, and 23' to your right, and that will be approximately the beam with of the road. 40* total spread is very wide, most road optimized bike reflectors I've seen and tested are on the 15 to 20* total spread range. Yes, I do mean the color scale. peak lux on the ground was 115 or so, so by scaling it so that 60 is absolute peak, it can change the overall perception of the chart. Honestly these charts can be difficult to read and compare with charts from other sources, and partly why most companies don't really show them off (if they are doing any optical work at all) since it can be pretty easy to misconstrue or misrepresent the data. I do know what you are getting at in terms of having a dead even lux amount on the ground all the way up to a hundred meters in front of you. However the issue becomes that to do that, requires that the light is mounted in the exact same height and exact same angle every time. The variations in pitch and height can throw off those bird-eye plots wildly. For example, by setting the light height 7" lower in a simulation, I can double the lux on the ground immediately in front of the bike (from 115 to 240), however the human eye is a tricky thing, and the actual perceived brightness will be very hard to tell the difference between 240 and 115 lux. I did go back and forth between several different variations of beams and what might work on a real-world ride and I felt this was a best compromise between theory and real-world application. I aimed to do exactly what you are suggesting and I do believe since you will have fairly even illumination from 0 to 25m is huge (0 to 82 feet!). Beyond that it's hard for the human eye to perceive the difference between 60 lux and 20 lux or even down to 3-4 lux. Especially on a flat surface like a road. I do look forward to hearing your thoughts on it if you do pick up the road version. This absolutely will not be a locked and frozen design even after the launch. We are keeping the minimum order quantities from our suppliers low right now, even though it does cost us more money solely for the fact that it allows us to make changes more rapidly without having to sit on thousands and thousands of components. So if you guys feel there is a change that should be made to the programming (super easy) or the beam pattern (not so easy, but doable) then we'll have the ability to make those changes within a reasonable timeframe. Won't just say "wait until next year". Mounting height in my opinions is better as high as possible. Not only beam range changes through different fork levels or bumps doesn't affect oncoming travffic that much like with low mounted lights. I guess you know what i want to descibe? Talking about mounting in the exact same height and exact same angle every time, it's already technically possible to put an light on an small bicycle steadycam or put a gyroscope and stepping motor into the case to adjust it automatically like in some cars. The brand new Trelock LS 970 I-GO has an integrated level meter for correct mounting. So what's described on 24 pages for cars is now possible on bicycles within seconds. Programming would be great if it would be customable for every lamp before/after buy. And maybe by placing several LEDs on different positions so by dimming/switching them off different beam shapes could be realised during a ride. Like only far distance beam on paved roads, full beam in forests and close are on combined pedestrian/cycle lanes/areas with street illumination or to save battery. Or a short light LED voltage peak as light horn (in combination with (cable) remote). 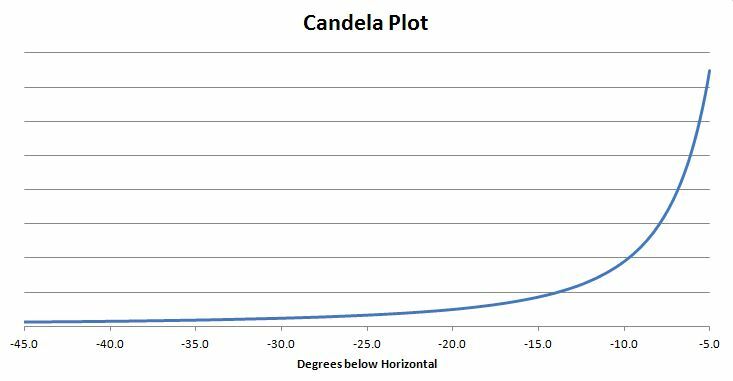 That plot you showed has the beam +/- 13 units either side at 30 units out. Anyway, the point is that my road riding is slow and windy, not zooming down the highway at high speed. I guess I will need to see the actual beamshot to decide. BTW, after we buy the unit, how easy would it be to change out reflector or LED? Random comment: Most lights I have used waste too many of their settings on insultingly dim modes, and have too much gap between "full blast" mode and the 2nd brightest. Those units in the plot are in meters, since we are mostly american users here, figured I'd give some units that are easy to grab the big tape measure and measure out in a driveway or yard. The reflector is a completely custom unit, however if there are upgraded reflectors in the future for this particular unit, it's pretty easy to take apart. I am sure you guys will be taking it apart once it comes out of the box anyways. No crazy messy sealants, the silicone lens does the integrated sealing, the only messy part will be the thermal paste. Last edited by angerdan; 10-23-2017 at 11:38 AM. The new Roxim's do look decent. I'm glad to see more of the industry trending towards that. Still haven't seen any that are focusing on a MTB specific type of beam using the downward firing reflector to control excess light going in the wrong areas, but I hope to see more soon! We got some good news from our supplier, the updated tool was completed and the new reflectors are on their way soon, as well as all our production samples for the casting, plastics, and silicone parts. Only thing we are waiting on now is the optical grade silicone lens. We are filming for our kickstarter this weekend potentially (if the rain stays away!) and hope to launch soon. Going to offer a deep discount for the very early birds. Looking forward to sharing more pictures and some more technical specs as the testing starts to get underway. Currently the hold up is securing samples of the Lumileds in the specific color group that we want. So right now any beam pictures are a fairly bright white OSRAM chip, far whiter/bluer than I want, but it's the samples that were on hand so that we could test thermal. Still haven't seen any that are focusing on a MTB specific type of beam using the downward firing reflector to control excess light going in the wrong areas, but I hope to see more soon! What about the Specialized Flux Expert, Philips ActiveRide and Supernova M99 Pro? Didn't know the ActiveRide had an off-road mode, news to me! Probably picking it up now to benchmark. The old Phillips is what turned me onto doing this. I knew I could make it even better. Is the Supernova M99 Pro able to be run off batteries? Seems most of their lineup is dynamo only. I do wholeheartedly think they have a fantastic product. I personally haven't seen or know anyone who has the flux expert. Reviews didn't seem to be too hot. Would definitely want to try and find more specific beam shots. An automotive high beam pattern is a good place to start, but often far too narrow for off-road trail use. After riding around a bunch with the Seca 2500 during a demo day a few weeks ago, I decided to redo the original trail specific reflector to better match their beam pattern. I was really impressed by it. Made me re-evaluate the importance of peak lux. The Niterider 1400 has a peak lux of 63 at 10m, the Seca 2500 had a peak of 58 at 10m, and some cheaper spot-like lights have peak luxes that can top 250 if they wanted. However I'd pick the massively wide and smooth beam pattern of the Seca over a high intensity spot for off-road use. I went back to the drawing board and redid the reflector to get that width and soften the hotspot intensity. So now this half priced light that can get twice the runtime at 1500 lumens will match the quality of light that comes from the $450 Seca. Takes a lot of engineering, but it's worth it in the end for that confidence on the trail. The M99 Pro only needs 24-60V DC, so it's possible. CAN-Bus isn't neccesary for light functions. The M99 Mini Pro 25 can be powered by 5-12V, so any powerbank can be used. And it has high beam like the M99 Pro. Images of the specialized could been found on CPF in the past. The M99 mini Pro looks like an interesting lamp. Seems none are available yet but they also going to be quite expensive, not to mention I don't think the price includes a battery. Yea it's brand new and has been first shown at this year eurobike. It could be available in 2018. Since it's main/primary market are pedelecs, there's no battery included. Is there a new target date for the KS campaign? Still looking at November? We are still targeting mid-November. 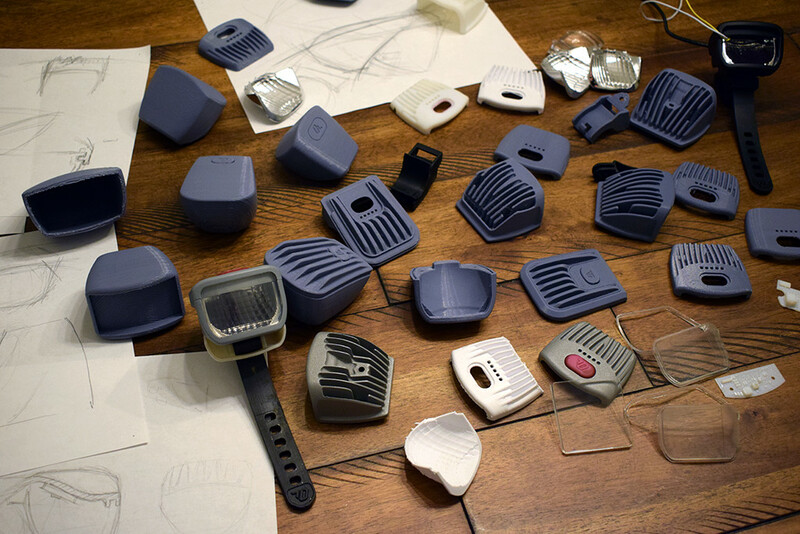 Production samples of the plastics and silicone showed up yesterday, and the castings should show up today or tomorrow. Been posting a lot more daily updates on our Instagram. We are hoping to do some filming for the video this weekend if the weather holds out. Then heading to Bentonville, AR for some photoshooting and general enjoyment next weekend before the KS launches. Will there be a remote version offered at KS campaign? Not at this time. Focused our efforts on a great LED chip, beam pattern, the reflector, and the longer battery life thanks to the efficient chip and driver. Any news about the close area peak lux? Is it still so high the eyes won't really adapt to the far distance at night as it seems on the full width beam plot? New reflectors came in and they are fantastic, well worth the cost of the redesign! Just now waiting on the final lenses that'll blend the light together further and soften things up, without losing the peak intensity. Pretty awesome looking right? The left is the cutoff that now has a nice and sharp defined line, and the right is the trail that has a wide spill of light, but a strong main intensity, while maintaining the even illumination field from the front of the tire to the area you are looking. Had a great photoshoot in Bentonville, AR, got to ride some amazing trails, and have been filming and editing for our video the last week and a half. We've decided that the super early backers will get to enjoy more than 30% off the retail price. So keep an eye here. Will you be offering just the lightheads in the kickstarter or only the complete kits? I'm thinking I already have my christmas present to myself picked out. We won't offer the lightheads on their own through the kickstarter page, however for members on here who are interested in the lighthead itself, I'll be extending the same discount and can purchase direct through myself or the website if we have it live by then. Had a lot of discussions internally about what to do, and the decision was made not to offer it through the KS page just because of the potential confusion it'd cause, no matter how many disclaimers we make that it wouldn't come with a battery pack. So will offer it, just not on the KS page itself. If that makes sense. Looking forward to seeing some videos & pics! Thanks! I'll be looking forward to this. Very interested to see real life images (or video) of the beam patterns. If I think the road pattern is not wide enough, can I ghetto rig an upper cutoff on the mtb one? This oath to be a great light if everything works as described. 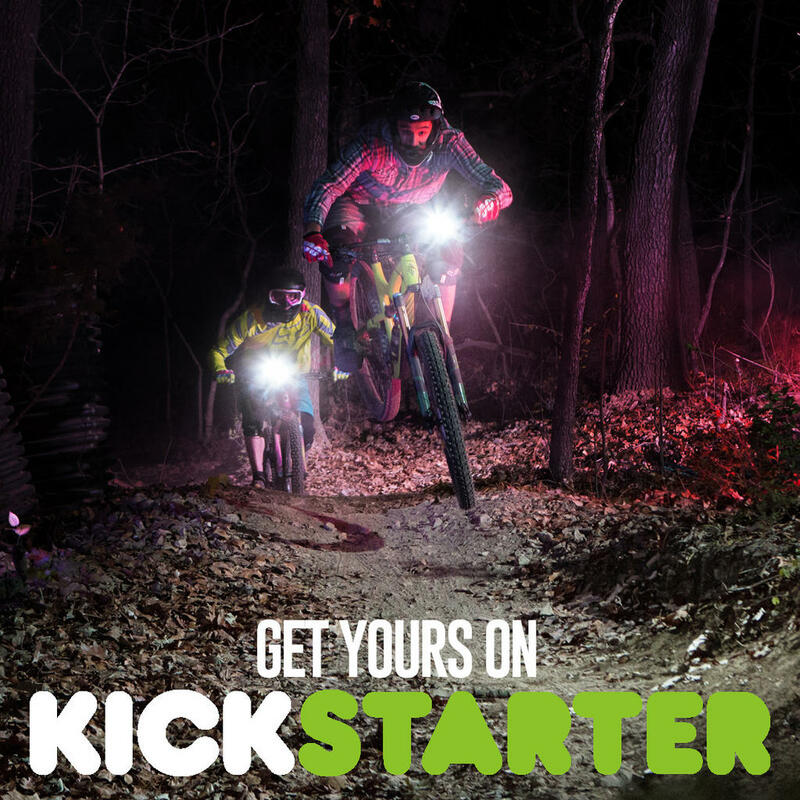 Will you be offering both road and trail versions of the light on Kickstarter? I've been riding the trail light for a few weeks now. And it simply is very different than normal lights. It rides more like a Seca 2500 than it does a 1500 lumen light, because of the beam pattern and design of it. It's really incredible. From what I understand, there will be Trail Kits, Road Kits, and a Trail&Road Combo kit available on the KS at launch. There will be steep discounts available for the first ones to purchase. Though I assume what your using is a prototype this is the type of information I'm wanting to hear about these lights. More efficient usage of produced lumens is the performance potential I hoped for from reading about this design. Sounds like it's working pretty good so far. Looking forward to trying the real thing myself. ......Looking forward to trying the real thing myself. I've been making my own lights for >7 years now. This light just might be the one commercial light I will buy. Maybe somewhere in the future you could acompany this light with a rear one? With your knowledge and expertise you could make a lot of people happy and make a good buck all at once. I am realy delighted with the beamshots i saw, especialy of the road light, which is i would assume more dificult to produce with good cutoff. Plenty of floodlights out there usable for the trail, not many for the road. I'd love to do just that. Though man oh man is it hard to compete with china on price when it comes to smaller components like that. Just the cost of PCB's with LED's, the battery terminal, and a battery itself would be about the same price as a cheap taillight that anyone could get off amazon. Since I'm all about simplicity, I certainly wouldn't mind just a well designed brake light that looks cool, and does the function well enough. No need for a $110 bluetooth app controled rear tail light IMO. You cant compete with prices but you can with quality, technical solutions and good old common sense addressing some issues. I would love in a taillight to looks nice as you say it, needs to be waterproof, have a plethora of usable light paterns for both day and night. Doesnt needs to be self contained but its a bonus, if its self contained, to be able to replace batery so the light isnt dependant on batery life. Good mount options are a must for seatpost and backpack a least. Also enough lumens to be functional, tbh i like realy bright rear lights, maybe find a reflector/optics/other solution with your expertise to make it highly visible but not blinding. Many rear lights on the market have focused beams and few others have flood beams that make a red aura behind bike. To combine both for long distance and side visibility would be ideal. Yea, an good rearlight would be great. Last edited by angerdan; 09-06-2018 at 11:18 PM.